Note: I am putting the most current posts on the top of this page. To read things in their proper order you should actually start at the bottom and read up. By clicking on the words "Photo Album" or "Video Clip" you will see additional media relevant to that day's entry. Finally, underlined words indicate clickable links. As we were getting Nick and Nate ready for bed on Monday of this past week, Laura mentioned to me that she felt like she could be pregnant. Considering Nick and Nate are the result of several years of trying and an incredibly talented fertility specialist, I thought the possibility of Laura being pregnant was remote at best. Nevertheless I told her we'd get the kids ready for bed then I would run to the store to get some ice cream and a pregnancy test. She took the test as soon as I got home and I was very surprised to learn that it said we were going to have a baby! I told her I dodn't really believe it so I'd go back and get another test. This time from another manufacturer. Once again, it showed us that we are indeed pregnant. We are very happy and think Nick and Nate will love to welcome a new member to the family. We have spent the last few days trying to decide in which hospital to have the baby. Nate was born at Glendale Adventist as that's were Laura's primary OB/GYN is located. It was a great experience and we loved our time there. 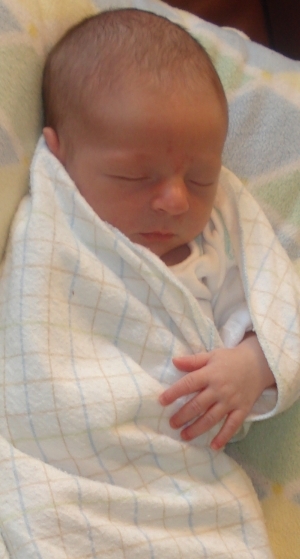 Nick was born at Community Memorial Hospital in Ventura which was another amazing experience. Dr. Keats was a great OB/GYN and we couldn't have asked for better. Interestingly, we live less than a mile from Henry Mayo Newhall Hospital. With two children at home we think it may be difficult to have a child in in hospital that's not close to home. Because of this we think we're going to go with Mayo this time.This way, anyone who comes to the birth can stay in our home and the boys can be in their own home until the very last minute. We think this will be a great experience. We have already begun thinking about a name. If we have a boy I would like to have his name begin with the letter "N". Actually, I would like to keep the "N" theme going whether it's a boy or a girl. There aren't too many names that begin with "N". For boys we can choose from Noah, Niles, Nelson, Nash, Ned and Neil. For girls I think I'd go with Nadia. I really like that name. It seems appropriate for a girl who skates. Yes, skating is in the future for this child. We're busy planning for our new arrival already. We need a larger home. Our condominium has just 2 bedrooms. It has been wonderful for us but I think the time may have arrived to consider moving. We have made an offer on a new home and we're waiting to hear back. It's not too much bigger than what we have now, but it is is big enough for three small children and it's in our current complex which we love. Nate, Nick, Laura and I are all healthy and times are good. The fact that we get to add another member to the family thrills us and we think it will be awesome. Just a few weeks ago Laura was mentioning that she's love to have another baby and I have always wanted 4 children. We know how lucky we are to have a 3rd child and we're committed to giving our new child a terrific life full of love and laughter. Every once in a while the moms from Nate's preschool class get together for a fun evening. Tonight was one of those nights. Considering Nick, Nate and I were free to do whatever we wanted, I looked at everything going on around town and decided that we'd attend a Pepperdine University basketball game. The University of Arkansas at Little Rock Trojans were in town and we thought it would be a fun way for the three of us to spend Sunday evening. I thought it would be a great opportunity to get some fantastic pictures considering Pepperdine sits on the coast. Unfortunately, there are so many fires in and around the Los Angeles area today that the sky is filled with smoke and we couldn't even see the ocean from the campus that sits just across the street. Our friend, Scott, is the Director of Basketball Operations for the team so we sent him an email to let him know we'd be there for the game. He wrote back that he'd leave tickets for us at the gate. It was very nice of him. The seats were very good (SEC 4, ROW G, SEATS 7&8) and were right next to all the coaches' wives. We settled in to our seats but soon decided the section we were in was a bit crowded and noticed the seats in the next section up were all but empty. We moved seats. The evening was pretty uneventful. The boys did a great job watching the game and being pretty well behaved. In the 2nd quarter we had to do a quick diaper change and got a couple souvenirs. The boys really wanted pom poms so we got an orange one and a blue one. We also got some snacks. At half time we accompanied Scott's wife Grace and their daughter, Avery, to a special room in the Helen Field Heritage Hall. It's a special VIP reception for the basketball staff and their families. After half time we returned to the game. The game was good but Pepperdine ended up losing by a point. At the conclusion of the game we were told that it was OK to go on the court. I took the boys out there and let them run around (video). The seemed to be having a good time. I was taking pictures, they were goofing off, and everything was great. 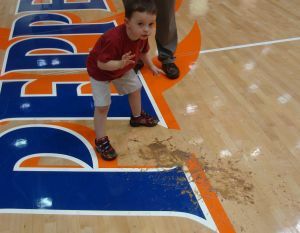 The next thing I knew, Nate was standing at center court and, all of the sudden, he bent over and vomited (video). I was stunned! I had no idea he was feeling bad. I got the wipes out of our backpack and began cleaning it up as fast as I could. The Pepperdine staff was very kind and told me not to worry about it, but I wanted to get it cleaned up as fast as I could. I got alomost all of it cleaned up when the maintenance crew showed up. As a matter of fact, I cleaned so much of it up that they had to be shown were the mess was. We left for home right after that. We headed up Pacific Coast Highway to Kanan Dume road with the intention of taking Kanan to the 101 North then the 23 Freeway to the 118. Half way up Kanan Nate threw up again in the back of our truck. We stoped on the side of the road to clean it up and continued towards home. Near the intersection of Kanan and the 101 Ventura Freeway we stopped at McDonalds to get a small Sprite. My thinking was that this would settle Nate's stomach. It didn't. About 5 minutes after he took his first sip, he vomited again. All told, he has vomited seven times so far this evening. Nick seemed to be doing fine. As soon as we got home I gave the boys baths and made up a bed for Nate on the couch. All the while, Nick was as happy as could be. I made him a late dinner, played around with him a bit, then sat down at the computer to update the website. Nick always likes to sit on my lap when I do this so I lifted him onto my leg. About two minutes later, he threw up all over the table. Fortunately, he missed the computer. Nick is on his third set of pajamas so far this evening. I expect it to be a long night and and pretty sure Laura and I won't be sleeping all that much. One of my favorite things to do is to get out of town for a couple days and see something new. It doesn't really matter where I go so long as I get to see something new and make memories with my family. I spend lots of time on the internet looking for places to go and the cheapest way to get there. Honestly, I am not too concerned with my actual destination. I just need to know that I got a great deal. I subscribe to all the airlines' email lists so I hear about most of their ticket sales as soon as they're released. That's kind of what happened this weekend. I received an email from Spirit Airlines announcing they were selling tickets from Los Angeles to Detroit for $58 round trip. I really had no desire to visit Detroit, but the price was just too hard to pass up. So, I bought a couple tickets, grabbed Nate, and headed to Michigan for the weekend. I knew it would be a fun time, and I really wanted to go with both Nick and Nate, but Nick is still nursing and can't be away from Laura overnight. His nursing days should be over soon which means there will be many more places we can go. Spirit Airlines is relatively small and, from Los Angeles, only flies to Detroit or Fort Lauderdale. There is only one Detroit flight each day and it leaves at 11:35pm. We had tickets for the Friday flight. I went to work and Nate went to school. We had a normal day. At 9:00pm we left for the airport. We arrived in plenty of time to check in, walk around, and take a few pictures. We had selected our seats online prior to the flight and had 5A and 5B reserved for us. We were pleased to learn that 5C was empty. I moved over to the aisle seat and Nate laid down and went to sleep. We brought a blanket with us and he used a sweatshirt for a pillow. He slept almost the whole time. I tried to sleep but couldn't. There was just not enough room for me to stretch out or anywhere to rest my head. Essentially, I just sat there and looked around for about four hours. 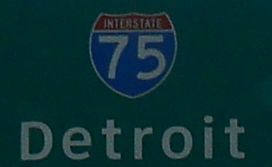 We landed in Detroit at about 7:00am, grabbed our luggage, jumped on the Enterprise Rent-A-Car shuttle bus and went to pick up our car. We rented a red Chevrolet HHC and spent an extra five dollars for the GPS system. I've used a GPS for quite some time, but have never had the newer model. This GPS was extremely easy to use. All I had to do was type in our destination and it took us right there. In retrospect, we never would have been able to find some of the places we went so quickly without it. We had a room reserved at Zehnders Waterpark and Hotel in Frankenmuth. Nate loves slippery slides and I thought he would really love staying at a hotel that had three of them. The largest water slides at Zehnders are four stories high. There is an indoor river and all sorts of fun stuff to do. We arrived at about 9:00am and knew that check-in wasn't until 4:00pm. We were so tired, though, that we probably would have paid for a second night just to be allowed to check-in and go to sleep. Fortunately for us, the lady at the front desk was very nice. She let us check-in immediately. I was soon to learn, however, that I was the only one that was really tired. I tried very hard to dleep, but Nate wanted to eat and go to the water park. So, I got out of bed, put on some clothes and headed to the hotel's restaurant. We had lunch, went back to the room, put on out swim suits and headed to the water park. We really had a terrific time. Once we were in the water I woke up and ended up having a great time. Nate loved it. We went on the water slide about 15 times. We rode on an inner tube that was shaped like a figure eight. We rode double and and laughed the whole way down the slide each time. After the day at the water slide we went back to the room, took showers, changed clothes and headed north to Saginaw to watch a minor league hockey game. It's the Ontario Hockey league that plays in Saginaw and tonight it was the Saginaw Spirit vs. The Sault Saint Marie (Canada) Greyhounds. I always enjoy hearing "Oh, Canada," the Canadian National Anthem, (video) as it makes it seem like we're so far away from home. We purchased our seats online about a month earlier and ended up in the third row. The quality of play was very high and the game was really good. After we picked up a souvenir hockey stick for Nicholas we headed back to the car for our drive back to the hotel. Along the way we stopped at McDonalds for a late dinner. After we ate we bought a couple pies (apple & pumpkin) to take back to the hotel. Once we got back we made coffee and hot chocolate and ate our pies. Considering it was 35 degrees outside and drizzling rain, it made for a very cozy night. The next morning we into town to get some breakfast. I really wanted to eat at a local place or even at Tim Horton's, a Canadian restaurant, but Nate really wanted McDonalds. So, off to McDonalds we went. It actually turned out to be a wonderful meal. This McDonalds has a real fireplace that heated the whole place. It was snowing outside and we had a great tall table in something similar to a sun room. We ended up staying for about 2 hours. I was having such a great time with Nate that I really did not want the meal to end. Eventually, we left and headed towards Detroit to see a professional football game. The Jacksonville Jaguars were in town to play the Detroit Lions. We had seats in the family section. 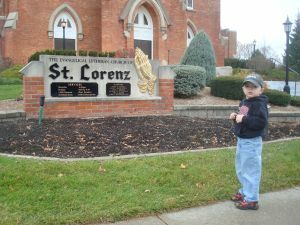 On our way out of Frankenmuth I noticed a small sign that said, "St. Lorenz Church - Turn Left." I couldn't resist. I followed the sign and found the church. I was amazed to see my name, minus the "e," on the big Lutheran church in town. Upon further investiation I found the St. Lorenz Campground, the St. Lorenz Lutheran School, the St. Lorenz Community Park and a few other places with the Lorenz name on it. Frankenmuth is a beautiful little town. It's completely German and very authentic. Nate fell asleep on the way to Detroit. He woke up when we were about 15 minutes away from the stadium. We parked in an overpriced lot and walked into Ford Field. It was about 35 degrees outside, drizzlling rain, and Nate was freezing. He had on a long-sleeved shirt, a sweater, and a big jacket. He was still cold. Once inside that stadium, however, he warmed up. We stayed for awhile but were surprised to see so many of the fans leaving early. By the end of the third quarter about half the fans had left. The Lions are a terrible team and the locals aren't too happy about it. They booed their own team and several fans walked out each time Jacksonville scored. We also left after the third quarter. We noticed Comerica Park, home of the Detroit Tigers, was a stone's throw from Ford Field. We took a few pictures, jumped in our car, and headed back to the airport. We returned the car, got a ride to the terminal, had a last-minute dinner at the airport McDonalds and waited for our flight. While we were waiting there was a Lufthansa flight set to leave for Germany. Nate watched the flight very closely. When the plane was ready to back away from the gate the pilot waved to Nate a few times. Nate loved this. It was very nice of the pilot to do that. On board the flight we were lucky enough to have the seat next to us empty again. The plane had to be de-iced before we could fly. Nate went right to sleep and only woke up when the pilot announced we had to prepare for our descent into Los Angeles. We got our luggage, jumped in our truck and heade home. In all, we were gone for 49 hours. We saw a hockey game in Saginaw, played at the waterpark in Frankenmuth, found the St. Lorenz Lutheran Church and saw the Detroit Lions football game. Not too bad for a $58 airfare. We're having quite a bit of fun around the house right now. Nate continues to do well in preschool and Nicholas is walking, talking an laughing with ease. He's also got quite a sense of humor. Laura and I decided it was time to get Nate involved in a sport. Considering he's four years old we thought it best to find something where he could start out on his own then eventually work into a team sport. The obvious choice seemed to be ice skating lessons followed by some level of participation in a local hockey league. We headed down to the Valencia Ice Station to inquire as to what was available to us. As luck would have it, they had skating classes for kids beginning at two years of age. We signed him up for a series of 10 weekly lessons every Tuesday. 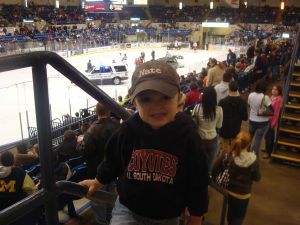 His class is called "Ice Tots 1" After he finshes Ice Tots 2 & 3 he will be eligible to begin the Hockey Tots program. If he is having a good time, we'll continue through the series of hockey classes. The following Tuesday we showed up for his first class. It said in the instruction sheet that, "Parents are allowed to skate with their children." Always wanting to be the supportive dad, I laced up the skates with Nate and he hit the ice. I skated once before and it was about 15 years ago. Nate has never been on skates. I was just grabbing the side wall and Nate seemed to be fine. When he first put the skates on he was able to walk all over the place. I thought it would be tough for him at first, but it wasn't. Once on the ice Nate did a little better that I did. To make a long story short, the instructor came over to me and kindly said, "I think he'll be fine all by himself." I got the hint and left the ice. Nate did a great job. They gave him and the other two kids in his class a metal device that helped him balance (Video). After just a few minutes of skating around the instructor took the bar and pushed it about 10 feet from Nate. She told him to skate to it. He did. Next, she threw a bunch of stuffed animals all over the ice and told the three kids in the class to skate around picking them up. They did. 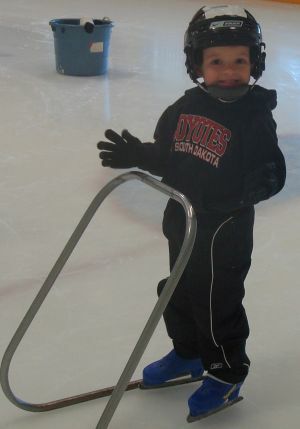 Nate was laughing and smiling the whole time he was on the ice. As soon as he left the ice he was asking when we could return. Considering he liked it as much as he did we went ahead and bought him some skates online. They arrived two days later and we'll have them for his next lesson. I went ahead and signed Nate up for an additional lesson. I thought it would be nice for him to have a private lesson prior to his group lesson. His private instructor's name is "CC" who is the mother of his group instructor, Jocelyn. He was a bit nervous at first to skate with CC but he got used to her real fast (Video). Nick, Nate and I have been to two high school football games in the last two weeks. We've seen Crespi vs. Saugus and Hart vs. Saugus. They were both played at the College of the Canyons. I especially enjoyed the Crespi game. To be honest, I went to the game to get a look at the parents and the supporters of Crespi High. It's an all boys school in the Valley and it's one that we're considering for both our boys. It has a very good reputation and many of its graduates have gone on to do great things. Nicholas enjoyed spending the afternoon at the skating rink. He was very interested in what was going on. The Valencia Ice Station has three sheets of ice so there is always something happening. As soon as he turns two years old next April Nicholas will be able to start skating, too. I think he'll enjoy it. I really love the time I get to spend with my boys. I enjoy the times the three of us are together. I also enjoy spending speding time with each of them individually. 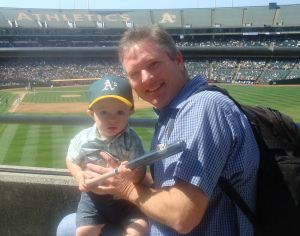 On this day I thought it would be fun to fly up to Oakland to watch the Oakland A's play the Texas Rangers. Nicholas is still nursing although not that much. Staying overnight wouldn't have worked yet, so we decided to make a day trip of it. I planned the day down to the minute. At about 9:00 in the morning the two of us left home and headed to Burbank airport. We boarded a Southwest Airlines flight to Oakland. I was a little nervous to see how Nick would do considering this was his first time on an airplane. He did a great job. He looked out the window and really seemed to enjoy himself. He's younger than two so he was allowed to fly for free as a lap child. Fortunately for us, there was no one in the seat next to us so we ended up with a free seat. Nick looked out the window, ate snacks and played with his toys all the way to Oakland. Here's a video clip of Nicholas during take off. You'll notice that he is fine the entire time. e simply sits in his seat and looks out the window. You can hear the landing gear retracting towards the end. He was this calm the entire time which is pretty impressive for such a young boy on his first flight. We didn't check any luggage so we walked right of the plane, out of the airport, and onto the Air Bart bus that took us to the nearest BART (Bay Area Rapid Transit) station. This turned out to be pretty convenient for us as the station was right in front of the Oakland Colisseum. The ride took about 15 minutes. We got off the bus, walked across a bridge and right up to the ticket window. We got some good seats on the 3rd base side in the shade under the second level of seats. Before we sat down we got a couple hot dogs, some fries, candy and water. We also bought a couple hats (one for Nate) and a mini baseball bat. The game was good although both teams had already been eliminated from the playoffs. We watched for about five innings then walked around the stadium. We took some pictures then had to get back to the bus so we could get to the airport and catch our flight home. The flight ws delayed a couple hours so we walked around the airport and had some dinner before we took off. The flight home was packed. Every seat was filled. Nicholas sat on my lap as everyone was boarding the plan. As soon as our plane got on the runway he fell asleep on my chest. He slept all the way home. I had to wake him up once we were ready to get off the plane. It was a wonderful time for me. Having Nicholas sleeping on my chest for an hour as we flew home was a terrific feeling. Once we got off the plane we got on the shuttle bus, headed to our truck and drove home. It was a terrific day and I am very proud of Nicholas. He did a fantastic job. It's not very often that we get a chance to take a whole week of and go on vacation. We have very busy schedules and can't usually find any time beyond the weekends to get out of town. This summer, however, we had a chance to get away and took full advantage of it. We decided on Scotsdale, Arizona. We thought we'd just hang out in the hotel pool and do nothing. It sounded like the perfect week. Scottsdale is roughly 400 miles from us. We didn't think Nick & Nate would enjoy such a long drive all at once so we decided to spend the first evening in Palm Springs. We booked a room at the Hyatt in Indian Wells. The drive there was about 200 miles and it seemed to go really fast. The hotel was very nice, although we didn't get to spend much time there. We arrived after dinner time so we just took showers and relaxed around the room. The next morning we spent time playing in the pools and going down the slippery slide. Nate really loved the slide. After a few hours we went back to the room, packed up, and continued the drive to Scottsdale. We packed our ice chest full of cold drinks and made sure we had lots of snacks for the trip. The drive itself was not too long. The boys slept most of the way. We arrived at the Hyatt Scottsdale at Gainey Ranch and were pleased to see that our room was very nice. The hotel is world class and we were excited to be there. We had a lake just outside our door, a great shower, comfortable beds and a big flat panel TV. We got cleaned up, poured some drinks, and walked the grounds of the hotel. It was beautiful. The next day our plan was to go get some breakfast then return to the hotel where we could spend some time around the pools. We went to Jamba Juice and then had some breakfast. It was a fun morning but we were excited to get back to the hotel's pool. There was a 42" height minimum for those that wanted to use the hotel's slippery slide. It was much bigger and a whole lot faster than the one in Palm Springs. Nate was really a full 42" at the time and one lifeguard told him he was not allowed to use the slide any longer. We appealed to another lifeguard and asked for another measurement. The second lifeguard sided with us and told the first guy to let Nate use the slide. It was a really fast slide and we all had a great time. Laura liked it, too. Nate had a fever for a couple days so we thought we'd go and get it checked out. There was an urgent care right up the street so we took him there. Everything was fine. At least now we knew we didn't have to worry and could continue enjoying ourselves. That night we thought we'd just order a pizza in our room but Pizza Hut told us they weren't allowed to deliver to the Hyatt as the hotel did not allow it. Nate and I drove down the block and picked up the pizza. The next day we went to Chase Field in Phoenix to see the Arizona Diamondbacks play the Pittsburgh Pirates in an unusual 12pm game on a Wednesday. We parked on the roof of a parking structure across the street form the stadium and went to get our tickets. It was about 115 degrees outside. Fortunately for us, the roof on the converatable stadium was closed and the air conditioning was on. Before we entered the stadium Nick and Nate got to meet some firemen who were parked outside. They gave the boys stickers and helmets. Once in the game we never even went to our seats. There was a picnic area in the outfield that we settled on instead. We bought some food and found a table way up high in left-center field. There was nobody else there so we had the place all to ourselves. It was the best way in the world to watch a game with the boys. They could eat and run around all they wanted. After we finished our luch we went to a playground area in the stadium. The boys were playing on all the toys and the miniature merry-go-round. They were having so much fun we forgot we were at a baseball game. We bought a hat, a ball, and a really neat rattler the Diamondback have that looks and sounds like an actual rattle you'd see on a snake. After the game it was off to the mall in Glendale. Laura and I had to attend her 20th high school reunion the after we returned home so she needed a new dress. We got the dress and walked around the mall. The boys found some stroller-like carts that looked like little cars and pushed them around for a bit. Nicholas had the best time in the pet store. He loved the puppies. After the mall we headed out to Chandler where there is a little ghost town called "Rawhide." We went to have dinner, look around, visit the petting zoo, ride a pony and take a trip around the town on the little train. We had a great time. The steak I had that night was the best I have ever had. The boys loved the place and we were all pleasantly surprised that we had such a great time. We spent much more time there than we anticipated and, quite honestly, are looking forward to visiting it again next summer. 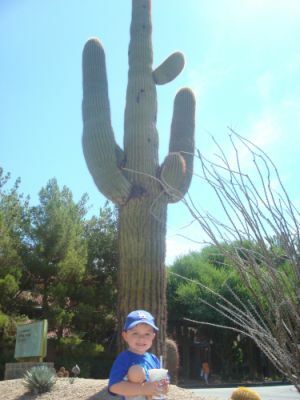 The next day we headed north to a town Called Camp Verde to vist the Out of Africa Wildlife Park. Again, we had little in the way of expectations, but it turned out to be a great time. The boys got closer to some of the animals than they have ever been and closer than most people will ever be. They saw all the animals you'd expect to see on an African safari. We were driven around the park in a tour bus and had a lot of time to just walk around and look at all the animals. Nate had the opportunity to feed a tiger. We took our new trailer out on its second trip. We had a wonderful time but there was a part of the trip that had me more nervous than I had ever been before. Our intentions for the trip were to spend a nice weekend together just having a good time and realxing. Laura and I have always viewed San Luis Obispo as kind of a second home, or at least our favorite getaway. In the past we have always stayed at hotels and gone out for every meal. This time was different, however, as we would be taking our new trailer and spending a couple nights in a campground. Buying a travel trailer was a big step for us. We don't make these decisions lightly. We already own a 2003 Dodge and decided that we did not want to waste any money buying a new truck just to tow a trailer. I did some research and learned that my truck, with its 3.9 liter, six-cylinder engine, and favorable axle ration, was rated to tow 4,800 pounds. My goal was to find a trailer that weighed much less than that so we could load it with our stuff and still be under the limit. We looked and looked and looked some more. Finally we found a trailer manufactured by a company in Indiana Called CruiserRV that made a nice trailer that had everything we thought we wanted and only weighed 3,700 pounds. This gave us 1,100 pounds to spare. We located a dealer in Irvine and bought one. We selected the CruiserRV Fun Finder X210WBS. After we bought it we had to have some hitch work done to the truck and the dealer wanted to prep the trailer. We picked it up a week later. On the way home I noticed that my little dodge was having a tough time pulling it. Nate went with me to pick it up. On the way home we stopped off in Glendale to meet up with Laura who was with Nick at one of his docotr appointments at Glendale Pediatrics. There is a big downhill right in front of Glendale College. Nate and I drove down the hill with the trailer in tow all the while hoping that we did not have to come back up the hill. We didn't. We meet up with Laura and Nick then continued to head home. I couldn't help but to notice that my truck was really struggling to pull a trailer that it should have pulled easily. I figured that, because I was new to towing, that I didn't know how a truck should really perform and that I was probably fine. Our second trip was to the town of Santa Margarita. It is just north of San Luis Obispo and has a nice lake. We drove up there on Friday evening. Everything was going fine. The truck was puling the trailer up Highway 101 without too much of a problem. Just north of San Luis Obispo, however, is a very steep, very long uphill that was almost the end of me. I got a running start and began up the hill. I had the gas pedal to the floow and was holding the steering wheel so tight I thought it would break. With the pedal floored I noticed my speed was dropping at a rapid rate. I started at about 60mph and quickly dropped to 50, then 40, then 30, then 20 and ultimatly down to 15mph. It was dark and I couldn't see the top of the hill. I dropped the gear down to 1st, kept the gas pedal down and prayed we'd make it to the top. All the while, Laura was telling me things like, "Don't worry. These trucks were designed to do this." She admitted later that she was very nervous we wouldn't make it to the top. We eventually made it, but for a long time I thought I might begin to roll backwards. We arrived at the KOA campground at about 9:00pm. The man working there guided us to our spot. We set up and got ready for bed. The next day we got up, had some breakfast and headed to the lake to try our hand at fishing. None of us really like to fish, but we thought we'd give it a go anyway. Of course, we caught nothing. We had a good time, though. For lunch that afternoon we headed into San Luis Obispo and ate at the California Pizza Kitchen. We walked around town, visited the mission, then headed back to the campground. We had a campfire, relaxed a bit and headed to bed. The ride home the next day was fine. We did talk quite a bit about getting a bigger truck, though. 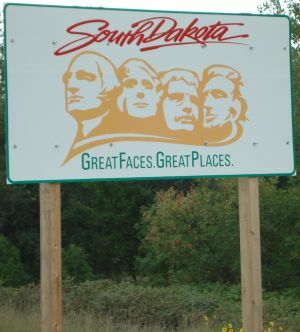 On September 12, 2007 Nate and I headed to South Dakota. I needed to meet with a professor of mine and thought it would be fun to take Nate along. Nicholas couldn't come as he was still nursing. The best deal we could find on plane tickets was from Ontario to Omaha, Nebraska for about $190 round trip each. The University of South Dakota sits in the extreme southwestern corner of the stae making it easy to get to from either Sioux Falls (55 Miles), Sioux City, Iowa (33 Miles) or Omaha (143 Miles). I flew through Sioux City once, but the only airline that goes there is Northwest which meant I had to fly to Minneapolis, change planes, then turn around and come back about 300 miles on a commuter plane. It makes for a very long day of travel. Sioux Falls is a great airport serviced by a few different airlines but has usually been about $150/ticket more expensive that Omaha. The fact that Omaha is about 90 miles further from the University really isn't a problem as the freeways are straight, flat, and empty. The speed limit on most of Highway 29 is 75 mph. We woke up at about 4:30 in the morning and drove to Ontario. We parked our truck in the lot, took the shuttle bus to the terminal and got checked in. The funniest part of the whole deal was that Nate was the one the TSA decided to do a complete security check on. I asked if I could take pictures and they let me. There were a couple people that asked me if I had requested that the TSA search Nate so I could take some good pictures. That wasn't the case. The genuinely thought he posed some sort of a security risk. Once we made it through security we had breakfast at Applebee's near our departure gate. The plane was an Embraer RJ45 built in Brazil and operated by a small airline called Express Jet. The airline ceased operation a few months after our trip. As we were boarding we asked if we could see the cockpit. 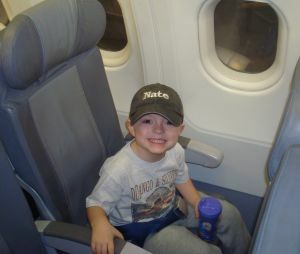 The flight attendant was terrific and took Nate right up to the captain and introduced him to Nate. The captain's name was Jack so Nate referred to him as Captain Jack the rest of the trip. The flight itself was fine but Nate was really tired when we arrived in Omaha. We got our rental car, installed a child safety seat and headed north for our 2 hour drive. Highway 29 leaves the Omaha airport, immediately crosses the Missouri river into Iowa then heads north through the Dakotas. Nate slept the entire time. We had booked a room t the Holiday Inn Express in Vermillion, SD. I chose the hotel because it is the nicest one in town and has a great view of the Dakota Dome - the place where the university's football team plays. After we checked in we headed to Wal-Mart which was only about 200 yards away. We bought some snacks, a few shirts and a University of South Dakota baseball hat. 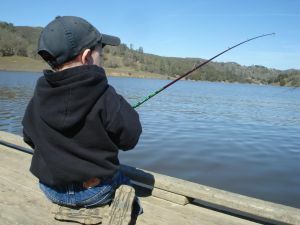 We also bought a fishing pole and a one-day license. Our intention was to spend some time fishing on the Missouri River at the Lewis and Clark Recreation Area in Yankton, SD. I really don't care for fishing, but it seemed like the thing to do while we were there. I thought Nate would enjoy it, too. Back in the hotel parking lot Nate saw a truck's license plate and said, "Look dad, Dodgers." Sure enough, there was a truck in the lot with personalized South Dakota plates that read "DODGERS." That was interesting. The owner happened to be nearby and we learned that he had lived in California but moved back to South Dakota. We freshened up a bit then walked over to the Dakota Dome to see if we could get in and look around. It was wide open and we had no trouble walking in and running around on the football field. I had Nate run around for some pictures then we walked over to McDonald's and then went to a nearby park to eat. It was about 9pm by the time we ate dinner but Nate met another little boy in the park (Prentiss Park) and they played for awhile on the playground. It was one of those hot midwestern nights so everyone in the neighborhood was out playing. After the park it was back to the hotel for baths, a late night snack and a good night's rest. The next morning we looked out our window and saw the University women's soccer team practicing. We walked over to watch. They all saw us sitting there and asked if Nate could come play with them. He had a wonderful time and they were really great to him. After practice we jumped in the car and headed to the city of Freeman for an annual event where the townspeople celebrate their heritage. I had called the organizers before we left home and made arrangements to participate in the city tour offered by a very nice man who had lived in Freeman all his life. We needed to get into town and look for a certain restaurant where we would meet our tour van. As you can imagine, Freeman isn't all that big so we had no problems finding the right place. We were a little early so we had some time to look at some of the animals in a petting zoo the had set up. Nate loved it. We boarded a little red van and were driven to all sorts of interesting places in and around Freeman. Personally, I absolutely loved it. It is a great little town with a rich history and wonderful people. No, it's not Los Angeles. It doesn't want to be Los Angeles. Everyone kept asking me why we don't leave the big city and come join them. It's tempting. 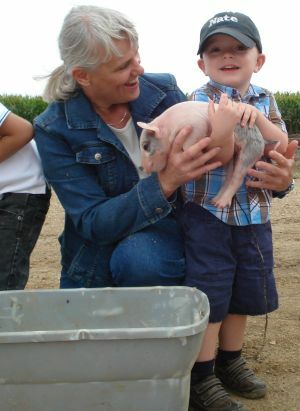 Our tour took us to a nature preserve that is also used as the local fighing pond, a neighborhood where all the houses had been moved into the town from the surrounding prairies, and the best stop of them all - the pig farm. I found the pig farm to be particularly fascinating. Clearly, the first thing you think of when you hear "Pig Farm" is a dirty place with smelly pigs and some guy in overalls chewing a piece of grass. Nothing could have been further from the truth. This was a first class operation. It was about as well run as a company that assembles computers. The level of cleanliness was amazing as the farmer has to be very concerned of animal-bourne diseases. The process of weighing, feeding and removing pigs for slaughter is completely computerized. The farmer has a room of computers just off the main animal pen. It tells him exactly how much each animal weighs, rations out its food, and confines it in an area so it can eat it all by himself without having to compete with other animals. Once the animal has reached the point where he is off to market, he is cleaned, loaded onto a trailer, hauled about a mile down the road, cleaned again, then loaded onto another truck which takes him to a slaughterhouse near Sioux Falls or Sioux City. I asked the farmer if places like Wal-Mart have cut into his profits. He told me it was exactly the opposite. He explained to me that Wal-Mart buys the pigs themselves. They do not use a broker. It is the broker, explained the farmer, that took the greatest share of the money. Without the broker, farmers keep more. Towards the end of the day at the pig farm, the farmer and his assistant brought out some pigs that had been born the day before. Nate really loved that. After our Saturday in Freeman it was back to the hotel to get ready for a football game. We had seats to see the University of South Dakota vs. Mankato State University from Minnesota. The evening was great. The National guard unit from Vermillion has been sent ti Iraq three times so far. Not all of them made it back. One guy was hurt pretty bad and was honored before the game. It was an emotional thing watching his mom walk him out on the football field and having everyone rise to their feet and cheer. The best part, though, was watching alll the opposing team players go shake the guys hand and pat him on the back. Waht a great way to start the game. After the game we retired to the hotel and got some sleep. Tomorrow was going to be a big day. We woke up and went to the motorcycle races in Yankton (Video). The riders there were much better than I expected. The racing was great. We watched a lot of it, had hot dogs and really enjoyed ourselves. Once the racing was over we headed to the Missouri River to try our hand at fishing. We didn't catch anything but we had a great time doing it. In Yankton the Missouri River serves as the border between South Dakota and Nebraska. There is a bridge that connects the states. Nate and I decided to cross the bridgeso we could get a picture of the "Welcome to Nebraska" sign. Once across, we turned around and drove back over it so we could get a picture of the "Welcome to South Dakota" sign. Silly, but we got some good pictures. At the end of the day we went back to the hotel, freshened up, then went for a walk all over Vermillion. We had a great time. Is was actually a cold night and it had been raining much of the day. After the walk we went back to the hotel for our last night in town. We woke up the next day and went to the university. We toured the campus and looked at the dorms where I had stayed for four summers. We took some pictures then went to meet with Dr. Bright. We met for about an hour and made some plans as they related to what the good professor expected of me next. After the meeting Nate and I ate breakfast at the Cherry Street grille then headed back down Highway 29 to Omaha where we boarded our plane for the flight back to Omaha. Nate did a great job flying. We did one diaper change and landed a short 2 1/2 hours later. Nate was wonderful the entire time. We took the shuttle bus back to our truck, drove home, and had dinner with Laura and Nicholas. It was wonderful to see them again. We live so close to our park that we think of it as our backyard. We spend tons of time there paying and going for walks. On this day we were trying out Nate's new skates. This is Nate on his first day of school. He attends a preschool operated by the Episcopal Church here in town. It has been a tremendous learning experience for Nate. He was very scared on his first few days of school but eventually got used to it and now loves going. He has made lots o frinds and we have met many of their parents. All around it has been a great decision. Nate will stay there for two years of preschool and then a third year of "junior kindergarten." Junior kindergarten is a program for kids whose parents have chosen to start them in kindergarten when the child is six years old rather than five. After all my years in the school business I've observed that kids who start school at six, regardless of whether they appear "ready," do better over the course of an educational career. We're not ina ny hurries here and we want to make sure both our boys go through school a little bit older and more mature than their peers. Most of these pictures were taken at Dan & Tara's house in Moorpark. There are some shots of us working on our office as well as going to Home Depot. You'll also see a few shots of Laura and Nate as they got ready to go see Beauty and the Beast at the performing arts center on the campus of the College of the Canyons here in Valencia. This next set of pictures come from our weekend trip to Ventura and Santa Barbara in July 2007. We had a nice hotel room right on the beach, had fish and chips on the Ventura Pier and spent a day at the Santa Barbara Zoo. It's our favorite zoo as it's not too big and sits just off the beach in a beautiful location. The first photo album is just some pictures that we took around the house. There are also pictures of a wedding we attended in Van Nuys (Nate's first babysitter), Nate out in the garage, having dinner at Wahoo's Tacos, our old office on Langside Avenue in Santa Clarita as we were moving out and into our newer, larger retail space, and a trip to Sam's Club to buy a new printer. Wow! We have certainly been busy around the house these past couple months. So busy, in fact, that finding the time to update the website has been a bit challenging. Laura and I have been enjoying our time with our new son, Nicholas. This has been an absolutely wonderful time in our lives and we're very thankful to have two healthy and happy little boys. Life could not get any better for our family. 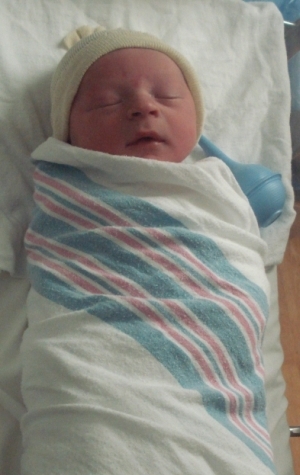 Nicholas Steven Lorenze was brought into the world on April 25th at 1:33 in the morning. This was one night in my life that I will never forget. The days my boys were born will always be the most wonderful times of my life. I don't think there is anything that can give me a greater feeling of complete happiness. It almost took a turn for the worst, however. Our plan for April 24th was to check into Community Memorial Hospital at about 7:00pm. Laura's and my parents met us at out house and we all drove up to Ventura. We had a nice, relaxing dinner on the beach at the Aloha Steakhouse then headed over to the hospital. It was also Dana's birthday. Once at the hospital we got Laura situated into her room and everyone came in to visit with her. After an hour or so Dr. Keats came in and the families left. We had a nice visit with the doctor. The families were waiting outside in the waiting area. I was going back and forth relaying messages to everyone as to Laura's status. Laura was hooked up to an IV drip to help induce labor. As she was laying in bed we had some time to ouselves. The room was great. It was very comfortable and we actually felt like it was a pretty romantic time for us. As the night progressed Laura was getting so tired that she could no longer carry on a conversation. I decided to read magazine articles to her as she fell asleep. After we had gone through a few stories in the National Geographic Travel magazine she was asleep. I was just sitting there thinking about how great things we. It was a very peaceful time and I was about to meet my new son. To say I was excited would be an understatement. The next time Dr. Keats came into the room we asked him when Nicholas would be born. He said it was tough to be exact, but it would most likely be in the "Wee hours of the morning." We asked him if he would be going home for some rest and he told us we were his only patients this evening and he was going to stay right there until Nicholas was born. He mentioned there was a sleeping room for doctors across the hall and he would be taking catnaps there. At about 1:15am five nurses came running into the room. They were clearly very concerned about something but didn't say a word. They grabbed Laura and rolled her from side-to-side and one of them, obviously the one most skilled in the operation of the vitals-monitoring machine, began looking at the machine and flipping all kinds of swithches. It looked like she wanted to determine if it was working or not. Apparently, she was satisfied that the machine was in proper working order. They tore all the wires and IVs off Laura and rushed her across the hallway to emergency surgery. During this whole time they did not say a word. We asked questions but they just kept working on Laura without saying a anything. One of the nurses handed me a mask and an operation room hair net/hat and told me to get ready in case I was allowed in. She went in to the operating room and came right back out to let me know I would have to wait outside. I was getting bits and pieces of information as this whole thing was playing out. No one was telling me anything but I was listening as hard as I could to what the doctors and nurses were saying to each other. What I could tell at this point was that Nicholas' heart had stopped beating and they didn't know why. They needed to get him out as fast as possible so they could work on him. Dr. Keats performed a C-section during which Laura stopped breathing - twice. Each time someone walked in or out of the room I tried to sneak a peek. There was lots of blood everywhere and three doctors working feverishly. I think one of the doctors could tell I was scared to death. Once, when the door was open, our eyes met and he gave me a hand sign letting me know everything was going to be ok. That was one of the nicest things anyone had ever done for me. It let me know that my son and wife were both going to be fine. At last I could relax and enjoy the moment. What a moment it was! In the middle of all the activity a nurse came out of the room, handed me a bundle of blankets, and said, "Here you go , sir. This is your son." Wow! That was great. It was a very emotional time and one that I will never forget. It was made a bit more special for me as Laura was going to be recovering from her surgery for 4-5 hours and I was allowed to take Nicholas to the nursery to get him checked out, bathed and given a birth certificate. After that I got to take him to our room (#222) and snuggle with him until they brought Laura to us later in the morning. 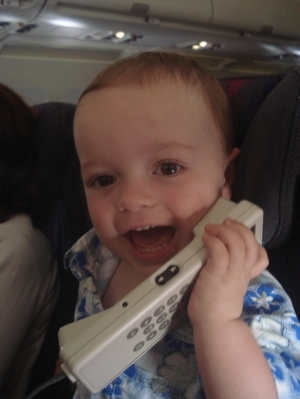 My original plan was to call the grandparents as soon as Nicholas was born to let them know how everything went, but I waited until I spoke to Laura first. Once I knew she was OK and Nick was healthy, I went ahead and made some calls. We had always thought Dr. Keats was an exceptional physician. On this night he proved he is one of the best. I found a few articles on him when I was trying to learn as much as I could. In Article #1 Dr. Keats discusses Group B Strep. Article #2 is a brief version of his biography. Article #3 talks about Dr. Keats performing his stand-up comedy routine at his Temple. 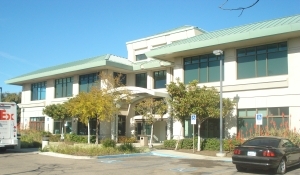 The next article discusses the sale of his practice, The Buenaventura Medical Group, to Kaiser. There's another article I found from the Center for Health Professions in which some of their future leaders are mentioned. And I also found a copy of the Community Memorial Hospital Magazine that covers the period of time during which Nicholas was born. On Fathers' Day we all went to Dodger Stadium and watched them play the Angeles in an interleague game. The Angels won 10-4. It was really, really hot. Laura stayed in the shade with Nicholas for most of the game. After the game fans were permitted to play catch on the field. We went to get in line but it was so long it looked like it would have taken us about 2-3 hours to get in. We decided to head to Montrose and have dinner. Nate enjoys watching some of his shows on the PBS Kids Sprout Network. His favorite is Make Way for Noddy. Others he enjoys are Fireman Sam, Charlie & Lola, Angelina Ballerina, Jakers and The Wiggles. Thomas the Tank Engine is a short, five-minute show that we sometimes watch in the evening. Interestingly, there is a "real" version of Thomas that travels around the country letting kids hop on for a ride. April 21st was Laura's birthday and we spent the first part of the day in Fillmore riding Thomas and going out to breakfast at the International House of Pancakes. Additionally, I have a few pictures of Nate helping me get our new office setup and some shots of us taking a break at Starbucks. It's Tuesday and that means a visit to Dr. Keats' office in Oxnard. While I was at work, Nate and Laura headed up Highway 126 for their 10:50 appointment. Dr. Keats confirmed that Nicholas is ready to be born and a time was scheduled for the delivery. Tuesday evening, April 24th, at 7:00 Laura and I will arrive at Community Memorial Hospital in Ventura to check in and begin the process of welcoming our son into the world. Nate will be with us as will other family members there to help watch him. Considering we have a business to operate with two locations, and that we will need the time at home to get to know Nicholas, we have decided that I would take some time off of my daytime teaching job. I have saved up enough vacation time to take a month off. This will be wonderful for all of us. Laura and I will both be here for our two boys. I am excited to spend this time with our family. This Friday will be the day it all begins! Laura and Nate headed up to Dr. Keats' office in Oxnard this morning. We were very anxious to hear what he had to say. My last words to Laura as I left for work in the morning were, "Beg him. Do whatever it takes and get him to induce labor." We're very excited to meet Nick and just want him to get here. Laura is getting very big. We have all Nick's clothes ready, his bed is ready to go and his room is all set up. We're just so happy he's coming that we're fining it hard to be patient. Needless to say, Dr. Keats did not suggest we induce labor. He did say, however, that he was sure Nick would be born this week. We sure hope he's right. This is really a wonderful time around our home. Any minute now we are expecting Nicholas to arrive. Laura is experiencing some contractions but they are not close enough yet to warrant a trip to the hospital. Of course, we thought we we ready to welcome Nicholas into the world last Tuesday. Laura was experiencing quite a bit of pain, and the contractions were about ten minutes apart. We decided it was time to go. We loaded our things into the car and headed up Highway 126 and to Communitiy Memorial Hospital in Ventura. Months ago we preregistered so the check-in process was pretty smooth. We got into a room and Laura was attended to by the nurses. They hooked her up to a machine to monitor her and Nick's vital signs. They told us we had about an hour before we would know anything. Keeping Nate calm and quiet in the room for that long seemed like it would be a challenge. After all, it would be very hard to sit in a chair for an hour without doing too much of anything. We decided to take a walk and get some dinner. We headed to a Mexican place called Yolanda's which is next to the hospital. We had dinner while we watched the end of the Lakers game and the beginning of the Dodger game. An hour later we were back at the hospital only to learn that Nick would be arriving another day. We're so excited to meet him that we were a bit disappointed we had to wait longer, but we also felt good that Nick was proceding right on schedule. His due date is Actually April 29th so we have about three weeks to go. Laura has been in quite a bit of pain today. We both thought Nicholas would be born tonight. We both worked at our tutoring center until 7:30. I picked up Nate and Laura came straight home. We called the hospital in Ventura right away. Laura described her symptoms to the nurse in the Labor and Delivery Department and asked if we should come in tonight. She told us to wait a bit and that it did not sound like Nicholas was coming this evening. Dad called from Moab, Utah. He's on a motorcycle ride and is due home tomorrow. He wanted us to call him immediately if Laura went into labor in which case he'd jump on an airplance and get to Ventura. Please bear with me. I am trying to get everything online ASAP. The "Photo Album" links will take you to some older pictures, not the ones you're probably expecting. I'm working on it and will have it up soon. To say that life around the Lorenze home has been happy would be an understatement. This is a time in our lives when everything is going our way. We understand that the course of a normal life takes a person through some highs and some lows. Right now, we're riding the wave of some really good times. Things have been very busy but that's the way we like them. There have been many great things that have happened recently, but at the top of the list is.........we're going to have another son! Laura is set to deliver our second son on April 29th. Coincidentally, this is also our 12th wedding anniversary. We have decided to name our son Nicholas Steven Lorenze. We chose Nicholas because it's a traditional name that can be used in its formal version, "Nicholas" and can also be a bit on the informal side - "Nick." There are lots of Steves in my family, but Nicholas will be named after my dad. The reasons for this are many, but I view it as a way to honor my dad who has protected my brother and me from the day we were born. We aren't always good at saying it, but we appreciate it. 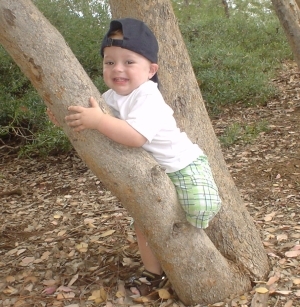 Like his brother, Nicholas is the product of an in vitro fertilization. Nick and Nate come from the same group of embryos. Although they will be born 2 1/2 years apart, they were conceived on the same day. Nicholas has simply been in the freezer down at the San Diego Fertility Clinic a bit longer. We have been monitoring Nick's progress very carefully. On December 5th we went to the Kaiser Permanente hospital in Panorama City to find out whether we were having a boy or a girl. Obviously, we were told our baby is a boy. We were extremely excited to learn we'd have a son. 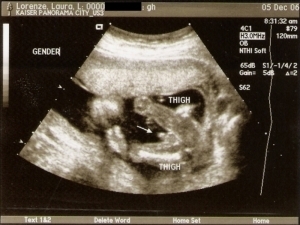 The pictures were very clear and it appears that we're having a little boy who will be on the tall side. He looks like he has very long legs. A couple days after the ultrasound appointment I was at work when Laura called to let me know that a genetic counselor from the hospital had called us to say that there was something on the ultrasound that led her to believe our son my be born with Downs Syndrome. To say we were surprised is an understatement. We quickly accepted the fact that we would have a child with Downs and got on with our lives. Regardless of his situation we remained thrilled to be having a new son. We made an appointment to visit the geneticist and review our family histories and discuss further testing. Essentially were were given a big decision to make. We were told that we had a 0.2% chance that Nick would have Downs. That meant a 99.8% chance that all was fine. At this point we should have probably thanked the hospital staff for their time and gone home. We were told that we could have an amniocentesis performed. This would give us a definitive answer as to Nick's status. While we were all for an answer, we were told that the process of sticking a big needle into the sack containing the unborn child posed a 1% chance of causing a premature labor which, in our case, would have resulted in our child not surviving. Considering our emotional state, and the desire to prepare for our Downs child if necessary, we opted for the amnio. It was a gut-wrenching decision. The physician explained to us that the spot that was seen on our ultrasound is common and happens in about 20% of all ultrasounds. He further explained that it was his belief that the "spot" on Nick's heart was nothing more than the reflection of the ultrasound signals. He also told us that his own daughter had the same thing on her ultrasound and the dismissed it as statisticaly irrelevant. We, on the other hand, wanted to know for sure where we stood and, possibly, if we would need to prepare to receive a child with Downs. We went ahead with the procedure. Everything turned out fine. Nick is very healthy. Since my last website update I have changed employers. Laura and I have started a business and it is quickly becoming bigger than we thought it would. We own an after-school tutoring center. When we began I was a school principal and a director of special education. In this role I had little spare time. Add to that the fact that we have a growing business and that we are expecting another child, we decided something had to give. Keep in mind that Nick is an in-vitro baby. While we ended up with one baby in this in vitro cycle, we transfered three embryos. I really thought we'd be having three babies. So, three babies, a growing business and a job that required more time than I had meant something needed togo. In the end, my job was the least imortant so it went. I resigned my principalship and accepted a teaching position in a special educaiton room. This gives us more time to spend on the business and more time to spend at home. In the months that have since passed we have come to realize that this was the right decision at the right time. The business is growing at such a rate that it will soon become the sole provider of our income. This will be the realization of a dream I have had for several years. With the job change came a change in our medical insurance. We had to leave our Blue Cross policy behind and swith to Kaiser Permanente. This, in our minds, was not a good thing. It meant giving up our pediatrician and the OB/GYN that delivered nate, Dr. Frields. Instead, it meant that Nick would be delivered at the Kaiser hospital in Panorama City. We were a little concerned about the neighborhood and the facility and began to wonder if we should look somewhere else. Our thoughts were confirmed on December 26th when Laura began experiencing pains in her abdominal area. We called the Kaiser hotline and were told that we should immediately get to the Panorama City facility, 5th floor - Labor and Delivery, to get checked out. We did just that. The place was really run-down. I made a decision that I would do whatever necessary to insure Nick was born in a smaller, quieter, more intimate setting. After an extensive amount of research online I discovered that Community Memorial Hospital in Ventura had a contract with Kaiser and that Nick could be born there. We drove to Ventura to check it out and came away extremely pleased. We also found a new OB/GYN at the San Buenaventura Medical Group in Oxnard, Dr. Keats, who could take us on as new patients. He has turned out to be absolutely wonderful. Laura has been driving to the office on a regular basis to make sure the pregnancy is going just perfectly. On February 14th I turned 43. I also went with Laura and Nate to see Dr. Keats. The visit went well. On the way home I received a call from the National Bone Marrow Donor Center informing me that I had been identified as a possible match for a 46 year old woman "Somewhere in the United States." I was asked if I would submit to further testing. I was thrilled. As a matter of fact, I was so happy to have the opportunity to help someone that I think this may have been my best birthday ever. After all, I had the chance to help someone and was about to welcome my second son into the world. I went in for more testing the following Monday and am still awaiting word on the results. Nate is talking up a storm. He has invented a couple of new friends, Mr. Balbeek and Mr. Heebs. He mentions them every now and again. I don't know where he got the names, but I think he's pretty creative. He is making complete sentences and has a huge vocabulary. He can understand most everything we sy and is forming complete sentences on his own. It's a fascinating process to watch. Nate seems very smart to me but I guess all proud fathers say that. We have taken a couple trips since the last update. Our first was when we flew up to San Francisco for the weekend. We boarded our United Airlines flight on Friday night out of Burbank. We took off around 9:00pm and landed in San Francisco at about 10:00pm. Considereing we were going to be there for just a couple night, and that parking at our hotel was $40/night, we decided not to rent a car, but to use public transportation and taxis instead. After we landed at SFO we got on the airport train that took us to the BART (Bay Area Rapid Transit) station where we boarded our train into the city. The ride was about 45 minutes and we exited at the Powell Street station. From there it was only about three blocks to our hotel. I wasn't sure if it was going to be OK walking the streets of San Francisco so late at night with my wife and child. Fortunately, the town was very alive when we arrived, there were lots of people out on the streets having a good time, and our hotel seemed very close. We didn't have a map with us, but we studied the maps at home and were quite confident we could find it. We did. I was very surprised to see the hotel. Laura booked it online and did a very good job. It was absolutely beautiful. We stayed at the Hilton on O'Farrell Street. Checking in was very quick and we were in our room in about five minutes. Nate was especially excited to be there. He ran around the room laughing for quite a long time. I think he was happy to be done traveling and knew that we would be settling in for the evening. It was really nice to see him so happy. For me, that evening was one of my best ever. The three of us were in a strange city after having flown up from home and walking the dark streets. We were all in a new environment, but were now in our comfortable room and could finally relax and just enjoy being together. We didn't have a crib for Nate, so we all cleaned up, got our pajamas on and snuggled into the bed. We watched a little TV and were fast asleep. We had a great time touring the city. We also had a nice time at the San Fransico Giants vs. Colorado Rockies game. We also drove down to San Diego to visit Sea World. We thought it would be fun to get out of the house for a couple days so we loaded up the car and headed south. We stayed on Hotel Circle in the Marriot Residence Inn. It's a place that has a full kitchen which really comes in handy with Nate. We can warm his milk, keep his food in the refrigerator, and have all conveniences of home. We had one dinner in the Gas Lamp Quarter and a place called Moose Magillicudy's. The next night we ate at a small place right on the beach. It was a very pleasant evening. We spent some time before dinner running around on the beach. It was windy and a bit cold, but it was fun. The week of Christmas was spent at Disneyland with Pops, Nani, Dan, Tara, Carlee and Ashlee. It has become an annual event and we really have a good time. As always, we have some good PICTURES. Last week we went to the Universal City for another Wiggles concert. We had a snack at the Gorden Biersch brewery before te show then went and had a really nice time. Nate was bit tires, but seemed to enjoy himself OK. The highlight of the show was when Nate gave the roses he brought to one of the dancers who, in turn, would give them to Dorothy the Dinosaur. I was also happy that Captain Feathersword came into the audience and gave me a high-five as he passed by. See the Wiggles PICTURES. Nate took his safety test today at swimming lessons. He had to jump in the pool with all his clothes on and swin to safety. He did great. Today was also the first time he swam with fins on. This past weekend Nate and I went to the mall while Laura worked at our office. Nate and I got a new pair of shoes for Nick and we also got matching baby blue hats that said "Nick" and "Nate" on them. It will be fun to see the boys wearing matching baseball caps. The three of us also headed to the Chrysler dealer to see about getting a new car. We think we're going to need something a bit larger with a family of four. Laura's Chrysler is in the shop right now. She needs a new transmission. Fortunately, she bought the extended warranty when it was new so the whole job will cost us just $100. We think we got very lucky. We've sent a sew emails to other dealers asking for quotes on certain cars that interest us. I think we sent notes to the Honda, Volkswagen and Volvo dealers. We both favor the Volvo and will buy one if it's somewhat close to the price of the other two. Laura is experiencing lots of labor pains. For a minute I thought we were going to have to make our mad dash to Community Memorial Hospital tonight. Nick isn't due to arive until April 29th, but we think he might be a little early. We drove down to Pasadena this afternoon. We went to pick up a changing table pad for Nicholas at the Pottery Barn for Kids store. We had ordered it on a trip down there last week and it arrived during this week. Nate slept all the way down there so I waited in the car while Laura went in to pick it up. Once we got back into town we did some shopping for a new stroller and car seat for Nick. We heard from our neighbor, a Highway Patrolman, the the Graco Snugli Ride is the is the safest one out there. We checked a coupke stores to find the right tyoe and color but didn't see one in either place. We need to get it fast so we'll probably do some shopping during the week. I have now experienced my second Father's Day. It has to be one of my favorite days of the year. Laura's birthday, our anniversary and Nate's birthday are other favorites of mine. Being Nate's dad has got to be about the greatest thing ever. I feel tremendously honored to be in this position and go to bed every night feeling like the luckiest guy on the planet. Simply hanging out with Nate and Laura on this day is about the greatest way I can think of to spend the day. We did that. While I don't really expect them, I received some great gifts, too. Nate made me a wonderful sign that said, "I love my daddy." He also had some pictures of himself framed for me. I loved them all. Laura got me a new digital camera that can also take videos. I'll be using it on this site from now on. It's a great little camera that takes nice pictures. Quite a bit has been happening around our house since the last update. One of the best things we do is go on walks in the park in the evening. After it gets dark, we go on a walk to give Nate a chance to run around, look at the stars, and to work off some energy before he takes a bath and goes to bed. These walks have become my favorite part of the day. Nate loves them, too. We walk through Valencia Summit Park. Sometimes we play on the playground, other times we watch the people playing a late game of tennis. Every once in awhile we just walk through the park and come home. Nate really enjoys this part of the day. Ha makes sure to say "Good Night" to the stars, the trees, the animals that live in the park and all our neighbors. I can't think of a better way to end the day. While visiting our neighbors with Laura, Nate tripped and fell. His front teeth actually dug themselves into the cabinet that houses our neighbors' TV. Nate was bleeding pretty bad. Laura got it stopped and got him cleaned up. We called the dentist and he said this was a common childhood accident and that the blood was, most likely, coming from the inside of his lip and not from his teeth. He explained that it's tough to tell because the blood gets all over the inside of the mouth. He told us it really wasn't anything serious and that we needn't worry. Well, we still worried, but Nate is doing just fine. One of his front teeth is turning brown, but we were told this was a temporary matter and that the tooth would return to its normal color in time, maybe as long as a year. Nate's pediatrician, Dr. Henry, and his staff found it pretty funny when Laura called tham and asked what we should do for Nate upon learning learning he had just eaten cat poop. They told us they would have to do some reading and would get back to us. They did. Apparently, it isn't too serious. We laugh about it now but, at the time, we were pretty nervous. Nate is completely obsessed with trash trucks and everything related to trash. If we are out on the town and he sees a dumpster, he'll say, "Trash!" We can't take the trash out of the house unless he's involved in it. He carried the trash and actually drops it into the dumpster. Of course, I have to hold him up, but he really enjoys dropping it in all by himself. Nate's couson, Julia, lives in Texas. She came out to visit recently and we had the opportunity to go to Chuck E. Cheeses for dinner and some playing. Nate had a really good time, as did the rest of us. Laura, Nate, Julie, Jula and I all went. While the food isn't the greatest, there were lots of games to play and we had a good time. Nate really likes to get in the front seat of the car. Actually, he like to sit in Laura's lap and pretend he's driving. He plays with all the instruments on the dashboard. I'm glad he's so interested and I hope this means he'll be a proficient driver someday. We have actually driven around the condo complex with him in control. He has a great time. As you know, Nate is the product of an invitro fertilization. At the time his was created, several other embryos were created. Nate was born after our second round of IVF. In the first round three embryos were transfered, but none survived. In the second round, three more were transfered and Nate was the one who made it. There are four embryos left. They are in the freezer at the San Diego Fertility Center in Del Mar. On August ninth they will be transfered into Laura. We could have up to four more children or we could have none. We'll see how it goes. We really, really hope we can have another child or two. This would be absolutely wonderful. Nate would love a sibling or two and we really want to increase the size of our family. We're keeping our fingers crossed that everything will work out just perfectly. Laura has been visiting the Fertility Center in Del Mar once a week in preparation for the embryo transfer on the 9th. So far, everything looks great. Typically, Laura will drive down to Dad & Dana's house the night before her appointment, spend the night, go see Dr. Hummel, then drive straight home [Video]. It has a tough schedule for her to keep, but one we know will benefit our family in the long run. For the 4th of July we walked back down to the park with some of our neighbors. The city puts on a fireworks show that we can see from our lawn chairs. We ad a good time talking with everyone and watching the show. It's been quite a long time sibce the last update and quite a bit has happened. Nate attended a birthday party at Gymboree, he is continuing to go to his swimming lessons at the Santa Clarita Athletic Club [Video], he rode the merry-go-round and other rides at the mall [Video], Dan and Dad came out to go with me to take some motorcycle parts to the powdercoater [Video], Laura, Nate and I visited Dan & Tara in Moorpark [Video 1, Video 2], the three of us visited friends in Chino Hills, the weather has been above 100 degrees for about two weeks, Laura flushed her driver's license down the toilet by mistake, Nate and I went to the government center in Van Nuys to get an official copy of his birth certificate and had lunch at a small Mexican place on Van Nuys Blvd., We found a goose in the middle of the street when we got back - we gave him some water [Video], Dad & Dana spent two weeks on Kauai and now Dad is riding his motorcyle (KLX600) from Montana to New Mexico to Arizona then flying home from Tucson. Laura and I have been faced with several life-changing decisions lately. Having aother child, and wanting to spend all our time with Nate, means we had to seriously look at our lives and see if there was anything we could do to simplify things while at the same time making sure we continued to progress along our course. We have a tutoring company/learning center in Santa Clarita that continues to grow and we would like to see it expand to the point where it becomes a very successful business. We are on the right track, but need to expand, perhaps open a second office in a neighboring community. We have some employees now and believe we ill need more to accomplish this. More employees would lessen the burden on Laura and me to be in the office all the time and would insure that one of us could be home with our kids at all times. As a UCLA alum I thought it would be fun to take Nate to the campus for the day. Laura was up in Napa for a friend's wedding and Nate and I were by ourselves for the weekend. We walked all over the campus, watched a water polo game, had lunch in Ackeman Union, climbed the Janss steps, walked through the law school, the architecture school and some of the buildings where I had classes back in the 80's. We also suffered a loss in our family this month. 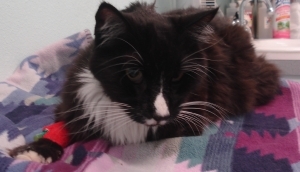 Lucky, our cat, died on Sunday at the Saugus Animal Hospital. He had been feeling pretty bad for the past couple weeks. He was panting really hard Sunday morning. I picked him up to pet him. When I set him down, he just fell over. We rushed him to the hospital, but the told us that he had kidney failure as well as heart and lung problems. We made the very difficult decision to relieve him of his discomfort. The three of us were all in the room and Laura and I held Lucky as he went to sleep. It was a very sad moment. He was about 20 years old and had become a fixture in our lives. We adopted Lucky from an animal hospital in Lancaster. His first owner brought him in to be put to sleep because, as his medical records state, he's, "Too affectionate." It's hard to believe someone thought that. We loved having such a loving cat as part of our family. Lucky had a very distinctive personality. He was a cat who thought he was a person. He had undergone many medical treatments in his time. The most serious weas the ten-day quarentine when he underwent nuclear radiation treatment in Irvine for a hyper-active thyroid. He came through just fine. It's still hard to believe he's not here at home with us. He'll be missed. Nate got a rash all over his body. It goes from the top of his head to the bottom of his feet. At first we figured it was a reaction to some Amoxicillin he was prescribed, but we then thought it could be something more serious like measles. We decided a trip to Dr. Henry's in Glendale was in order. We had called his office in advance and the nurse on the phone thought it sounded like it could have been Hand, Foot & Mouth disease. Once he saw Nate, the doctor's opinion was that Nate was, in fact, having a reaction to the Amoxicillin. We looked all over the web and saw pictures of others that reacted negatively to the antibiotic and the pictures looked just like Nate's current state. We're pretty confident it was just a reaction and will be glad when the rash goes away. Nate feels great. He's been very active and, other than the rash, shows no signs that anything is wrong. This was Memorial Day weekend. We really didn't do too much other than take care of a few things around the house. There were a few odds and ends that needed to be taken care of but nothing major. Laura's mom and Nate's aunt Julie came down to see Nate on Saturday. 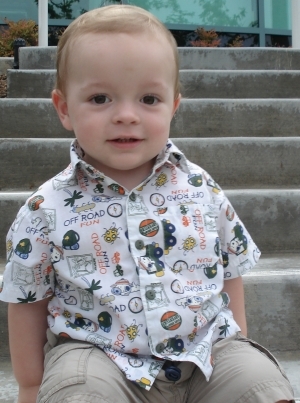 They went shopping with Laura and picked up a few outfits for Nate. They also stopped by Home Depot to get some kitchen cabinet brochures and planning materials that we'll review in preparation for our pending kitchen remodel. Since our cat Lucky came back from his week on the run he hasn't been feeling too well. Unfortunately, he has decided that using our carpet for his personal cat box was one of his options. Unfortunately for him, he now resides in a tent on our back balcony. It sounds kinda funny that we have a cat living in a tent outside our back door, but it really is a good idea. He has a nice place to live with all the ammenities and we have a clean house. Besides, our other cat loves having the place all to herself. He comes out for a few visits during the day, but he sleeps there at night. Saturday was another Wal-Mart run. It's our usual place to get supplies for the week. This time we arrived and saw a tent in the parking lot. It said Coca-Cola all over it so I figured it was a snack bar. I told Laura to park near it and we'd get a couple Cokes before we went in. As it turned out, it wasn't a snack bar. The store was having a sidealk sale. We were lucky enough to find diapers for about $8 for a big pack. Typically, this pack costs over $21. We bought all they had in size 6. They only had three boxes. We felt really luck to have found them for such a cheap price. Sunday was a trip to the park and a barbeque at home. We watched the Angels beat the Minnesota Twins in eleven innings and just hung out around the house. The past few weeks have been quite eventful around the house. We continue to be very busy and do lots of different things. Our anniversary was on April 29th so Laura and I headed up to Salt Lake City for the evening. Essentially this was a very fancy date night for us. Laura went to college in Utah and we met while she was still a junior. We spent quite a bit of time up there going out on dates and the city has always held a special romantic place in our hearts. We drove down to Nate's grandparents' home in Laguna Niguel on Friday night then caught a flight from Orange County directly to Salt Lake. Nate spent the weekend with his grandparents while we were away. We arrived in Salt Lake in the morning. We had breakfast at Mimi's Cafe in Murray then spent some time touring the town. While I don't think we'd move there full-time, we have always thought it would be a great place to have a second home. There is quite a bit to do there during all four seasons and real estate isn't all that expensive. We stayed at the same place as last year, the Hotel Monaco. It's a very nice place with a unique style. It's certainly not a national chain type place. I think some would call it a "boutique" hotel. Regardless of what you call it, it's a great place and we'll probably stay there every time we're in town. We had a very nice dinner in the restaurant in the hotel which is actually a first-class place. The next day we did a little shopping around town, got Nate a hat with his name on it then headed back to the airport for our trip home. We were very excited to see Nate, but I don't think he was all that excited to see us. He was obviously having a good time while we were away. While we had a great time, we were constantly thinking about Nate and it was nice to see him again. Pops came out last week for a motorcycle ride. We rode right from my garage and headed towards the trail system between Santa Clarita and Lake Hughes. I think the ride was about 110 miles or so. We rode some trails & dirt roads up to Lake Hughes and had lunch at the Rock Inn. We then headed west. The trail we chose ended up in Gorman. At that point we had to chose whether to reverse our course or take Highway 5 south to Valencia. We opted for Highway 5 and were home in just a few minutes. Although it wasn't a difficult ride, it was fun to get out on a motorcycle. Nate continues to be involved in lots of activities. 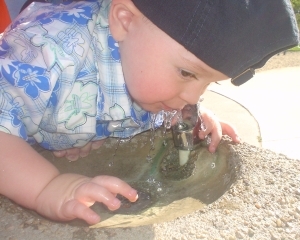 He attends gymnastics, a playgroup and is enrolled in the Musical Stepping Stones program. His vocabulary is increasing rapidly and he can pretty much repeat anything we say to him. It seems like he is growing up way too fast. He has turned into a little boy and is no longer a baby. He is fascinated by the way things work and tries to figure things out if he doesn't know how they work. He is very good at opening and closing plastic buckles like the ones found on a car seat, a stroller or a high chair. Nate is also very good at going down slides. He likes them big and twisty. He has a really good time at the park. He also enjoys the computer and likes to look at websites like PBS Kids and Barney. Laura shows him how they work and he sits and stares for extended periods of time. Nate had his 18 month appointment. He's now 20 months old. We have been somewhat concerned that Nate gets pretty hot when he sleeps. He likes to sleep without covers. He has a ceiling fan above his bed and will usually kick the covers off himself during the course of the night. Every now and again his temperature will get as high as 104 degrees. When it begins getting that high we give hime alternating doses of Motrin and Tylenol and use a cool, wet cloth to keep him from getting hotter. Every now and again we'll put him in the bathtub. He has had two episodes of seizures in his young life. He's been to Children's Hospital in Los Angeles and now had a pediatrician in Santa Clarita, Dr. Feldman, who started her medical career as a neurologist. We're very pleased she took us on as new patients and feel Nate is getting great care. Nate is doing very well right now, but Dr. Feldman is going to run some more tests on him when she returns from her daughter's medical school graduation in Israel. On the lighter side, Nate keeps us laughing by doing funny things on a regular basis. As an example, Laura turned her hair dryer on recently and noticed fire coming out of it. Nate had stuffed it full of Q-tips. Mother's day happened this month. I think Laura had a really good one. As we were falling asleep that night we noticed that one of our cats, Lucky, was missing. We discovered he ran away. He stayed away for a week. Laura and Nate put signs on all the mailboxes in the area and we received several calls from neighbors telling us they had seen him. We thought he was gone forever, but exactly one week after his disappearance, it began to rain and Lucky decided it would be a good time to come home. We heard him meowing outside the door. He's home now and everything is back to normal. Nate reached a major milestone in that he got his first haircut this week. We went to Gumball Alley in Valencia and they were terrific. Nate did a really good job and, as usual, we were very proud of him. It's just so difficult to believe that he has turned into such a great little boy so quickly. 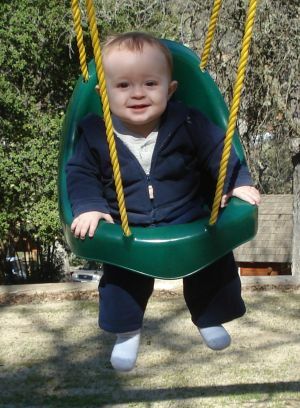 It seems like only yesterday that he was a little, tiny baby. Easter Sunday was last week. Laura, Nate and I went to mom's house in Woodland Hills where we met up with Danny, Tara, Ashlee and Carli. We had a late breakfast then Laura, Nate and I headed north to Ventura to go on a bike ride. We had a flat tire on one of the bikes so we needed to pick up an inner tube somewhere along the way. It wasn't too easy to find one on a holiday. For one, we didn't really know where all the stores were along the way. We finally got lucky at a store in Oxnard. Once we had the tube in hand, we went to the beach. We began the ride in front of the Ventura County Fairgrounds. I changed the tube real fast, set-up Nate's trailer, then we headed out for a ride. We went a couple miles up the coast then turned around and rode down the coast. Pops called us while we were on the ride. After the ride, we stopped at McDonald's in Ventura for a quick bite to eat then headed home on Highway 126. It was our last day of Spring Break. We had a really nice day but were sad to see vacation coming to an end. Laura had her birthday this week. We celebrated by going out to eat at the German restaurant on Lyons avenue. Because of our schedules we had an 8:30pm reservation. We had a very nice meal and Laura got her present. Laura's mom and sister came down to watch Nate while we were at dinner. On the 23rd the three of us had a really great time. The Wiggles were in town from Australia and we had seats way up near the front. We saw The Wiggles last summer in Minnesota and were very excited to see them again. Nate and I had been practicing our dance moves for months before the concert. We wanted to be able to do all the moves along with the band. We record every episode of the TV show and we pretty much know all the words and moves to all their songs because we practice every night. We had tickets to the 5pm show at the Gibson Universal Ampitheatre. This venue sits in a great place place on top of a hill, right next to Universal Studios and right on Universal City Walk. We arrived in time to have lunch at the Hard Rock Cafe. After that we walked around a bit then headed to the concert. There is a water display/fountain that comes out of the sidewalk there. Although Nate was having a pretty good time, he was a bit disappointed that he couldn't play in the water. Obviously, we didn't want him to be wet the rest of the day. We got into the concert about 45 minutes before the show started. We got Nate a hat and found our seats. The Wiggles have a character named Dorothy the Dinosaur. She is well know for eating roses and drinking rosey tea. It's traditional that the kids all bring Dorothy roses when they go to a show. We brought a dozen with us. During the course of the show, some of the dancers go out into the audience to collect the roses on Doroty's behalf. We were very lucky that one of the dancers came right to Nate and spent some time with him. He seemed to enjoy it quite a bit. He handed over the roses with a smile on his face. We were very proud of him. Throughout the entire show he appeared to have a really good time. He was very interested in everything that was going on. Laura and I also had a wonderful time. Those who know them are well aware The Wiggles are absolutely awesome entertainers. The three of us had a wonderful time just hanging out and having fun. Before Nate was even born, Laura and I understood the importance of a solid and stable home for him. At the root of the stable home are Laura and myself. We believe the best gift we can give to Nate is a childhood where he feels safe, secure and loved. We try to remember that, in addition to being parents, we are also husband and wife. To that end, we try and make sure we take a little time here and there to let each other know how important each of us are, not only to Nate, but to each other. With that in mind, we're headed up to Salt Lake City for our anniversary on Saturday morning. We'll drive down to Laguna Niguel Friday night to see Nate's grandparents. We'll spend the night there then fly out of the Orange County airport early Saturday morning. We'll stay at our favorite hotel downtown and have dinner in the hotel's restaurant that night. It's a fine dining place and is absolutely great. We were there for our anniversary last year and loved it so much we decided to go back. Nate will spend the night with Pops & Nani. We expect he'll have a fun time. We're on Spring Break right now. It's an extra special time for us as this week, along with two weeks at Christmas, are the only times during the year that Laura, Nate and I have no obligations other than to spend time with each other having fun. Yesterday we took a drive down to Laguna Niguel to visit Dad & Dana. We stayed over night and had a really relaxing time. We arrived around lunch time and headed to Laguna Beach to get something to eat. We ate a Ruby's Diner then headed out for a drive around town. During the drive we went through Laguna Beach and Newport Beach. We also spent some time walkng the Dana Point Harbor. The bast part of the walk was watching Nate hold Dusty's leash as we walked along. The tour itself was nice, and we even drove the car onto the Balboa Island Ferry, but the fact that we're on vacation with nothing else to do made it especially nice for us. We spent the night in sleeping bags and woke up nice and early the next morning. We played on the computer a bit, watched the beginning of the Dodgers vs. Pirates game, then headed to Coco's for breakfast. After breakfast we headed over to Leisure World to see the condo dad bought as an investment. He completely remodeled the place and put it back on the market. After that stop we headed up to Irvine to visit Mission motorsports. After that we came home. In all, it was a pretty quick and simple trip, but is was especially nice for us because our only goal was to relax and have fun. We did. On a side note, there are exactly 6,000 until Nate officially becomes an adult. I have a feeling those days will pass by way too quickly. Nate continues to grow and do a good job. To us he's a very smart boy. He'll do things around the house that lead us to believe he is learning quickly. For example, he'll get a Q-tip out of the drawer and come try to put it in our ears. He'll grab a toothbrush, toothpaste, and try to brush our teeth. Additionally, he's becoming very good at repeating words we say. His vocabulary is becoming quite large. When we say, "Where's Pops?" he'll go into his room and point to the picture of his grandfather that's hanging up. It's amazing. It's really fascinating to wath him progress. Now, when I say things like, "It's time to take a nap," I know he understands as he will usually cry. He does not like to sleep too much. He will obey simple commands and tries to converse with us all the time. We expect him to start talking in complete sentences any time. Nate's favorite TV show continues to be The Wiggles from Australia. We have all their CDs and have already seen them in concert when we made the trip to Minnesota. They are on tour once again and we have rally good seats to their show at the Universal Ampitheatre on April 23rd. Our seats are really good. They're on the aisle, in the orchestra pit and in row GG. I'm not sure how far back Row GG is, but we know it will be close to the stage. The show is promoted by the House of Blues in Hollywood. I signed up on their "preferred customer" mailing list which allowed me to buy tickets three days early. It worked out well and we're very, very excited for the show. Nate continues to be active in the community. He attends music class, gymnastics, story time at the library, and he's part of a play group with other kids his age. The play group meets on Tuesdays. Today it was Laura's turn to host, so we went to Chuck E. Cheese for some pizza. It was fun for all the kids. I was lucky to go as I am on Easter Vacation and am off work for a week. This past weekend we attended our final hockey game in Bakersfield. We had a good time, but Nate was feeling a bit restless so we left after the second period. Each time we go to Bakersfield we take Nate's pajamas with us and change him before we come home. He falls asleep in the car and it makes it easy to put him to bed when we get home. Today we got a bicycle trailer. It's a trailer designed to be pulled behind a bicycle. The trailer holds two kids. We thought it would be a fun thing. It would make for a great activity for us. Nate can sit in the trailer, along with our lunch, and we can go on some nice rides. We're all looking forward to that. I assembled the trailer today and we went for a test ride. It worked great, but one of the tires later popped. I think I over-inflated it. I'll put a new tube in it and we'll be fine. 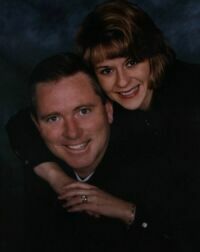 In a couple weeks Laura and I will celebrate our 11th wedding anniversary. Time is going way too fast. We'll celebrate by heading up to Salt Lake City for a night. We did this last year and had so much fun we're going to do it again. We'll fly up Saturday morning, spend the day in the city, and come home Sunday afternoon. It's a fast trip, but it gives the two of us a chance to have a "date night." It's good for all of us as Nate gets the opportunity to spend the night with his grandparents. I think we're all looking forward to it. Easter is less than a week away. We got all the stuff for Nate's Easter Basket. We'll be dying eggs this week and getting ready for an Easter egg hunt on Sunday. Nate had his pictures done professionally at Sam's CLub last week. Laura says they look great. We have an appointment with the photographer next weekend and we're looking forward to seeing the pictures. We plan on buying them and giving them to family. The job of parenthood continues to be the best one Laura and I have ever had. 99% of the time it's complete entertainment. Nate keeps us laughing and having a great time. It's tough to imagine life before he got here. On the other hand, parenthood is a very servious job. We see our role in a couple ways. 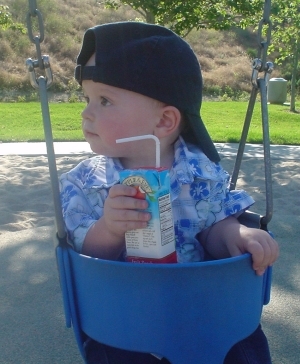 On one hand, we want to provide Nate with a childhood which is carefree and full of great memories. We want him to know he's safe, he's loved, and we'll always be here for him. On the other hand, we need to prepare him for life. We only have a few years to impart on him everything we've learned throughout the years. Obviously, Nate will spend the majority of his life as an adult, so we need to make sure he has the tools to be a happy and successful person during his adult years. To that end, we do some different things. One of them is trying to teach him to be bilingual Spanish/English. We purchased a special DVD-based Spanish instruction course from the British Broadcasting Corporation that is directed towards infants and toddlers. He watches it everyday and has begun to repeat some of the Spanish words. In our view, Spanish is becoming inreasingly important. Nate has been a very busy guy lately. He goes to Fun & Fit gymnastics to get some exercise an play with the other kids, and also goes to the Newhall Public Library for story time. He keeps a pretty busy schedule but still has lots of time to relax around the house. We've noticed that Nate is a very friendly guy and seems to be at ease with all the other kids and their parents. He seems to genuinely enjoy being around other people. Nate did a very good job navigating a maze they had set up at gymnastics. When he got to the end, he'd say, "ah..Boo!" which is something we do at home. At the library Nate does a good job listening and being friendly. Last time there he hugged all the other kids and enjoyed the part where he got to dance. Nate is a good dancer and even adds a few jumps. He's able to jump and get himself completely off the ground. Laura took some pictures of Nate at the library and sent them to me at work. That really made my day. We had tickets last week to see the Bakersfield Condors play but we didn't go. It was snowing on the Grapevine (Highway 5 north of Gorman) and cars were being held up for long periods of time. We decided it wasn't worth the risk of being stuck on the freeway with Nate in the car. Instead, we stayed home and just goofed off here. Tonight Nate and I went to McDonalds and had a happy meal. It was raining hard and Nate had a good time jumping in the puddles between the car and McDonalds. Nate did a good job eating his french fries and cheeseburger. The big news of the past couple weeks was Nate's visit to two different emergency rooms. He's fine now, but he gave us quite a scare. Late one night we noticed that Nate was running a fever. We monitored it closely and and gave him some medicine to try and break it. To a certain extent, the medicine worked alright. However, it do not solve the problem satisfactorily over the long term. We'd see periods of a few minutes when Nate's temperature was withing normal range, but it didn't last all that long. We tried a cold bath, cold washcloths on his head, and rubbing alcohol on his feet. All of these worked for a little bit, but nothing worked permanently. Nate was shaking quite a bit. I assumed it was because he was cold, but Laura insisted he had a seizure. Not being ones to take unnecessary chances, we headed up the street to Henry Mayo Newall Medical Center around 2am on the 18th. It was early Saturday morning. The doctor saw Nate, we told him what happened at home, and he told us Nate would be fine as long as we gave him Tylenol and Motrin on a regular schedule for the next three days. We got home around 4am or so and went right to bed. Nate slept between us. After we had been in bed about an hour, Nate had a seizure. It was the scariest thing I have ever seen in my entire life. His arms and legs were moving, almost violently, back and forth very rapidly. Laura and I were absolutely terrified. We felt completely helpless. We got out of bed, got Nate ready and decided we'd head down to Los Angeles Children's Hospital. We looked up the address online, then jumped in the car and headed out. It was about a 32 mile drive and there was no traffic at all. We found the hospital without any problems. We went right to the emergency room and were seen in about 15 minutes. 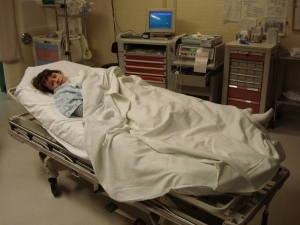 Nate was ultimately seen by two nurses and three physicians. All of them assured us the seizures were called Febrile Seizures and were a common reaction to high temperatures. I had never even heard of Febrile Seizures but was beyond relieved to learn they were nothing too serious. Nate got wonderful care at Children's hospital and we're thankful we are able to go there. 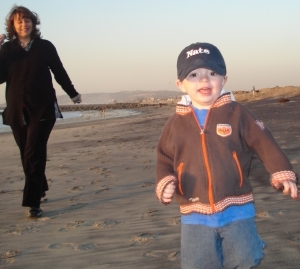 Once home, we called Nate's pediatrician and made an appointment to see him. We got in on Tuesday so Nate and I drove down to Glendale Pediatrics for his Tuesday afternoon meeting with Dr. Henry. The checkup went well and Nate was given a clean bill of health. Like the doctors at Children's, Dr. Henry assured us that Febrile Seizures were not uncommon and were also nothing to cause too much alarm. Once again, my feelings were put at ease. Laura and I are grateful for all the care Nate got. Right in the middle of all this Pops came up to watch Nate while Laura went to an appointment of her own. He drove all the way from Laguna Niguel to help us out and we appreciate it very much. This weekend was pretty relaxing. It didn't start that way, but Sunday was really nice. We have been very busy this past week and were glad that Sunday was simply a day to stay at home and rest. On Saturday morning Laura and I had to take care of a few things related to our business. We each went out and got our hair cut then headed down to Orange County. Our plan was to go to David & Margo's house in Orange, then head over to Dad & Dana's home in Laguna Niguel. We got on the road about 2:30pm and faced very heavy traffic.It took us about 2 1/2 hours to get to Orange. Once there we visited with David, Margo, Veena, Heather and Heather's boyfriend. We had a very nice dinner, then headed to Laguna Niguel at about 9:15pm. Laura and I had originally wanted to go out on a date that night while Nate spend time at his grandparents' home, but it turned out to be a late night and we simply ran out of time. Instead, we spent time visiting with Dad then we all went to sleep. Dana was in Palm Springs for the weekend. Sunday morning Dad had to work the Coffee Bar and teach Sunday School at his church so Nate, Laura and I headed to Dana Point Harbor and had breakfast at a place called The Brig. There was some sort of whale watching festival going on so we walked around and looked at everything before heading home. Once home, we did a bit of cleaning and that's about it. We cleaned out Nate's room and put some of his things in the attic. He has grown out of much of his clothes. We went through his closet and all his drawers and removed quite a bit of stuff. He has alot more space now. After his room was organized I rode my motorcycle up to the pet store to get cat food then over to Del Taco to get some dinner. The rest of the night was spent playing on the computer and watching TV. Nate went to sleep immediately after his bath. He must have been very tired. This weekend was pretty relaxing for the most part. Saturday we had some work-related stuff to take care of then spent the rest of the day relaxing at home. Dad was on his way from Mammoth to LAX to pick up Dana who was coming in from the Bahamas. He had a hour or so extra time so he gave us a call and said he'd be stopping by. It was good to see him. He had hurt his knee skiing and was using crutches. We spent the rest of the day hanging out at home and going to play in the park. At about 3:45 Sunday morning Nate got sick. Something wasn't sitting right in his tummy and it came up. We heard him on the monitor and got to his room quickly to make sure eveything was going to be okay. We decided that he should sleep in our room for the rest of the morning. Once he woke up, Nate had breakfast and seemed to be doing just fine. He was in a good mood and wanted to go outside and play. We gave him a bath then headed off to the Los Angeles Zoo. We decided to buy the Family Annual Pass so we can go to the zoo whenever we like for free. Once inside we began to walk around and look at things. Laura and Nate were both feeling a bit under the weather. We stopped and had something to eat and continued to look at the animals. After a couple hours we decided we should get back home. That was fine. After all, we have the annual pass now and can go back whenever we want. By the time we got back home both Laura and Nate seemed do be doing better. Nate played with some of the kids in the neighborhood then we all went to the park. Nate and I went on the swings, the slides, and ran around on the grass. After that we walked over to the store where I had to pick up some packing materials to mail some things I sold on eBay. After we got home we got a call that the husband of a collegue was in the hospital so we walked up there to see them. It's been a very busy month around our home. Among other things, I turned 42 years old. It's odd thinking my next "big" birthday is 50. I don't feel anywhere near my age. Nate's life continues to progress at a rapid pace. 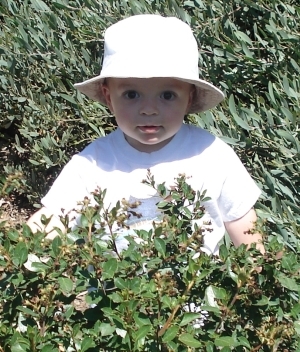 He's growing up very quickly and we find ourselves wondering where all the time has gone. Before we had Nate, we would tend to tire of stories about how quickly time passes when you have children. We certainly have a better appreciation of what people were telling us. I think we just get so caught up in our day-to-day lives that we lose some perception of how quickly time is passing. It seems like it was just yesterday that Laura and I were at the San Diego Fertility Clinic hoping things would work out for us. Now we find ourselves enrolling Nate in different activities around town and placing him in the lottery to enter St. Stephen's Pre-School next month. It's truly been a whirlwind. As people like to say, "Where has all the time gone?" We do make it a point to appreciate every day we have together. We feel beyond lucky to have Nate and look forward to spending every available minute with him and having fun. Laura has been taking Nate to the Newhall Library where they offer a story time for guys his age. We thought it would be a great thing for him as we just knoew he would love being exposed to books and all the great stories in them. Well, his first day at the library was a bit different than we had thought. He pulled lots of books off the shelves then set off the alarm on the emergency exit door - twice. In reviewing Nate's use of the library, Laura and I thought it would be a good idea to enroll Nate in an activity that was a bit more physical. So, off to Fit & Fun Gymnastics he went. Nate is now going to gymnastics class once a week. It gives him a chance to run around and have fun with other kids in his age group. It has been good for him and he seems to enjoy it quite a bit. We think it's had a positive effect on him as his second visit to story time at the library went much better than the first. Laura reported that Nate was an, "absolute angel." That's good news for all of us. We also decide we'd enroll Nate in a preschool. We chose St. Stephens as it offers a program where Nate can attend once a week for two hours and Laura can be there with him. Apparently it's a pretty popular program as we had to enter his name in a lottery. We'll find out soon if he's in. If so, that's great. If not, we'll continue looking for something similar. We sure hope this one works out, though. One thing we feel is very important for Nate is to speak Spanish. To that end, we bought a DVD-based program published by the BBC (British Broadcasting Corporation) that is designed to teach Spanish to infants and toddlers. It's got a cartoon character named Muzzy who speaks Spanish in such a way that it makes it easy for the young ones to understand and learn. There is also a CD of Spanish language instruction that Nate listens to at night as he's falling asleep. The materials even included a stuffed animal version of Muzzy. Earlier this month we heard an announcement on our local radio station about a boy in town who needed a blood marrow transplant. We decided we'd go get tested and see if we were donors. There was a testing center set up at the Vineyard Church on Calgrove her in town so we headed over there. We were somewhat surprised by the turnout. There were about 350 people there to see if they were a marrow match. It was great to see so many people there to help. Last we heard, nomatch was found. Laura and I are now part of the National Bone Marrow Registry, though, and we feel pretty good about that. We just hope that we can eventually be donors for someone who's a perfect match. We also were part of a blood donation drive by the new Providence-Holy Cross Medical Center here in town. People that we know own the local radio station and asked me if I would donate blood "on the air" and it would be a race to see who could get a pint out their arm first. I lost by 10 seconds. It took me about four minutes to get the blood out. We've been going to a few hockey games in Bakersfield. We've had really good seats and have had a great time. It's great to change Nate in the family changing room at the arena, then putting him into his car seat in his pajamas for the ride home. He's very comfortable and falls asleep every time. We had tickets for this past weekend but didn't go as there was snow on Highway 5 (The Grapevine) around Gorman and we heard reports of the freeway being closed off an on. I had the chance to ride a dual sport motorcycle with dad up in Ridgecrest this month. I had a great time. I drove up Saturday afternoon and met dad at the hotel in town. We had dinner with all the riders then went to sleep. The next morning we rode through the mountains near Ridgecrest. We had a good ride and my Suzuki ran great. I was very please with the ride. On the way home I stopped off at Laura's parents' home in Lancaster as Laura and Nate were there visiting. While we have been having a tremendous time around the house, and all is well with Nate, we did attend two funerals this month. Laura's dear friend, Molly, lost her father. Nate Laura and I all went to the funeral in Alhambra. Funerals always make me think about how important it is to appreciate each and every day we have with loved ones. Molly's dad must have been a great man as the church was packed full and everyone had wonderful things to say about him. The second funeral was for Laura's girlfriend who died rather quickly last week. She was 36 years old and had a three month-old son named Benjamin. She was a chiropractor here in Santa Clarita. That funeral was held at Groman Eden right off the 405 Freeway in Sylmar. During the eulogy people were asked to write letter to Benjamin about his mother. Laura did that tonight. I know it was hard for her. On a more happy note, Laura and I will be celebrating our 11th wedding anniversary in April. We're making reservations to go back to Salt Lake City for one night. Laura was going to college in Utah when we met and we spent lots of time there so it remains a pretty special place for us. Our anniversary is on April 29th and that day happens to fall on Saturday this year. Nate will spend the weekend with his grandparents in Laguna Niguel and Laura and I will fly from Orange County to Salt Lake Saturday morning. We'll be back Sunday afternoon. Essentially, this is a date. A time for us to go out to a nice dinner and reflect back on the days when we had just met and to think about how far we have come. Who would have known that, from a Chance meeting at Target, we would someday have such a great son and such a fun life here in Valencia? It's been fun from day one. Going back to Salt Lake every now reminds us that we were very happy way back in the days when we had much less than we do now. It reminds us that our happiness comes from enjoying each other's company and our son. It's good to remember that. Sometimes I look around and see people who are trying to find happiness in their possessions. Although Laura and I aren't without nice things, we know that our true enjoyment in life comes from our family. We have a blast together now and hope that we always do. We know we're in for lots of changes in the future, and we know we'll find a way to make them fun. We hope to have more kids - I would like four or five. We also know that more kids won't fit in our small home. While we love where we lie, we realize we'll be moving in a year or so. While we've considered just about every place in the country, we'll probably end up in the same neighborhood, but in a bigger house. We like it here, relatives are close, and our jobs & business are in Santa Clarita. This past weekend was three days long and we had a really good time. Dad and Dana invited us up to their place in Mammoth. We drove up Friday after work and arrived at 2:25 in the morning. Needless to say, we were very tired and glad to climb into bed. There was lots of snow on the ground and it was great to snuggle up inside where it was nice and warm. In addition to Dad & Dana, their frinds Tim and Lynn were there as was Alyssa. Lynn's daughter, Allie, was there, too. Alyssa took all the pictures we have of our weekend. Saturday was very relaxing. While some went skiing, the rest of us stayed back and watched the NFL football playoffs and just relaxed around the house. It was a much needed day of relaxation. On Sunday most everyone went skiing while Laura, Nate, Alyssa and I went for a walk. We pulled Nate on a saucer and even spent some time sliding down a snow hill. Nate seemed to enjoy himself. We decided to drive home Sunday evening as we had to be back to operate our tutoring center Monday afternoon. Our drive home was actually very relaxing. There was absolutely no traffic on the road and we made it home quickly. The first part of our drive was to get from the town of Mammoth Lakes to Bishop. It's about 40 miles and usually takes us well under an hour. This time, however, there so so much ice on the road that we drove very slowly all the way. Our maximum speed was about 25 mph. It took us a bit longer to get to Bishop, but we arrived safely and witout incident. The rest of the ride was smooth all the way back home. Every once in awhile I sit back and think about where I am in life and how things are going. Well, things are going very well. I think I am the luckiest person on the face of the earth. I have, without a doubt, the best wife that I could have ever hoped for. Additionally, I have a son who has brought us so much happiness that's it imposssible appropriately convey here on the website. Essentially, life is great and I have my wife and son to thank for that. The viruses that cause roseola are spread through tiny droplets of fluid from the nose and throat of infected people when they laugh, talk, sneeze, or cough. It is thought that the viruses are spread by someone who has not yet developed the symptoms of roseola. There is no known way to prevent the spread of roseola. Roseola often starts with a sudden high fever [103 °F(39.4 °C) to 105 °F(40.6 °C)] that lasts 2 to 3 days, although it can last up to 8 days. The rapid increase in temperature may be the first sign of roseola and often occurs before you realize that your child has a fever. The fever ends suddenly. After the fever ends, a rosy-pink rash may appear over your child's entire body, starting on the torso and spreading to the face, neck, and arms. The rash is not itchy and may last 1 to 2 days. The rash may appear without the fever. On rare occasions, a sore throat, stomach ache, vomiting, and diarrhea occur. During the night Nate's temperature went as high as 104.9. Laura gave him his medicine and he drank an entire 8 ounce bottle of water. After that, his fever broke and dropped back to the normal range. We'll notify Dr. Henry when his ofice opens and ask if there is anything we need to do. Even though Nate has been running a high temp, he still keeps his spirits high. During his bath he was showing me how he can blow bubbles. I have been blowing bubbles in his bathwater and he has started copying me. It's very funny to watch. Also, Laura has been counting to three and Nate can say "two" and "three." He even uses the same voice inflections Laura does. Last night Laura, Nate and I went to the hockey game in Bakersfield. As usual, we had a pretty good time. Nate was very well behaved and sat on my lap the entire time. Laura gave me tickets to several games this season as part of my Christmas gift. We sat right behind the goalie five rows up. I really liked that gift idea and am glad we can spend the time together. Yesterday was a very relaxing day around the house. We finished taking all our Christmas decorations down and getting everything back into the attic. It came down much faster than it went up. Other than that and the hockey game, we simply lounged around the house and didn't do anything. It was very nice and well-deserved as we're still tired from our very busy Christmas vacation. We're back in the swing of things now and I think we're all glad about it. Today the three of us spent some time working in our tutoring center's office taking care of some things that we don't usually have time to address during the course of the week. We did a few organizational things, hung some things on the wall and removed some of the wiring and fixtures the previous tenants had installed. Nate has been running a 101.3 degree temperature today. We gave him some medicine and a bath then gave him some milk and put him to bed. I think his high temperature is probably a result of the immunizations he got a couple days ago. The last time he got his shots he ran a high temp, too. It's tough to watch him go through this, but he does a really good job hanging tough. He's sleeping pretty hard right now and his breathing is just fine. We have really had a busy last couple of weeks. Once Christmas was over there was very little time to spare as we had to get ready for our trip to Nashville. There is quite a bit of packing involved when the three of us go anywhere, especially when it's for more than a night. On Tuesday evening our babysitter, Jesse, came over to watch Nate while Laura and I went out to dinner at the same Mexican place we went the night Laura went into the hospital to have Nate. We did a little shopping on our way as we needed a few things for our trip. After dinner, it was back home to start packing. Sometime past midnight we got everything together and went to bed. We got up the next morning around five or so, got ready and headed to LAX to catch our flight. We weren't leaving until 10:00, but we wanted to make sure we beat the morning traffic and we also needed to make sure we made it there in enough time to get seats on the plane next to each other. The airline hadn't assigned seats in advance and we were told we needed to get our assignments at the airport the day of the flight. Fortunately, we arrived in plenty of time and were able to get seats next to each other. On this trip, Nate had his own seat on the plane so we took his car seat and strapped it into the plane's seat. He did a very good job all the way there and seemed pretty relaxed. The flight lasted about four hours and he slept for the first three. As soon as we landed we got our rental car and headed to the hotel to freshen up. We stayed at the Marriot Residence Inn about 3 miles from the airport. Once we got cleaned up we headed out to find something for dinner. We thought we'd just make it a simple dinner and didn't want anything too fancy. We decided on a place called Shoney's. It was a family place and we figured Nate would do just fine. He did. He sat in his high chair and the waiter gave him a balloon. The food was very basic, but it did the job. We also stopped at the K-Mart near Shoney's to pick up some diapers and milk. The next day we slept in and relaxed before heading over to the the show called "Ice!" It was right in front of the Grand Ole Opry and consisted of a bunch of ice sculptures. We had tickets for 4:00pm. My thinking when I bought the tickets was that it would take us about 1 1/2 hours to see the entire exhibit, we'd spend another hour or so at dinner, then we'd go to the Opry to see the Radio City Music Hall Rockettes at 8:00pm. That plan didn't work out all that well. It took us all of 15 minutes to get through the Ice! show. When we entered they gave us big blue parkas and took our picture. They also informed us that it was just 15 degrees in the exhibit. That was cold. So cold, as a matter of fact, that we weren't too motivated to spend very much time there. I think everyone else was feeling the same way. I overheard others saying they loved the show and wanted to stay, but it was so cold they had to get out. As it turned out, we finished around 4:15 and had to wait until 8:00 to go to the Opry. On the other side of the parking lot is the Opry Mills shopping mall. We decided to go there and waste some time. We walked around for a bit. There was a Tommy Bahama shop that was going out of business and Laura was able to buy a very nice pair of pants for about $10. After that, Nate vomited and we learned he was coming down with a virus. His clothes were now dirty and he couldn't wear them the rest of the night and would need a new outfit for the Rockette show. 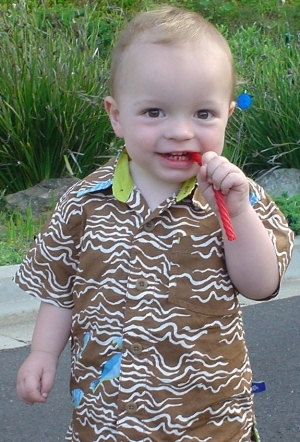 We got him a new shirt and some pants at the Old Navy store in the mall then had a bite to eat in the food court. I changed Nate's clothes in the restroom and he was looking like he was feeling OK.
After doing a couple laps around the mall, it was time to go to the Opry. We checked Nate's stroller in and found our seats. The were on the main floor in row five. After the show had been going for about 10 minutes, Nate became a bit restless and I decided to excuse the two of us and we went out to the lobby. Nate liked it much better there. He climbed up and down the Opry's three flights of stairs about 10 times. For a few minutes, he and I snuck into section 16, which is way up in the nosebleed section, and watched some of the show from there. After a few minutes of that, Nate wanted to get back to the stairs. We met up with Laura at intermission and the three of us returned to our seats for the second half of the show. I think Nate lasted about five minutes this time before we needed to excuse ourselves back to the stairs. Although I didn't get to see the show, Nate and I had a pretty fun time, and got a great workout, too. Laura really enjoyed the show. After the show was over, the three of us returned to the hotel for the evening. The next day we slept in again and got some much needed sleep. We woke up around 8:00am, ate some breakfast and headed out for the day. Our plan was to take Laura to the spa in Brentwood, TN where she was going to get a facial and a massage. Nate wasn't feeling too great and Laura was uncomfortable leaving him. I assured her that, if she went to the spa, I would make sure to get Nate to a doctor. We asked some folks at the spa if they could recommend a physician and they were very helpful, but nothing came of that. I then headed to the Target store there to get some Pedialyte to replace some of the fluids we assumed Nate had lost while vomiting. There was a pharmacy in the Target so I asked the pharmacist to recommend a pediatrician. He told me it would be near impossible to get into a pediatrician in the area without an appointment, but that was OK as there was a fantastic general priactice physician in town who operated a walk-in clinic and would be able to see us immediately. I bought the Pedialyte then headed to the other side of the freeway to Franklin, TN to see Dr. Rudge. He was a great guy who spent about a half hour with us. He explained to us that there was a bug going around that was making people somewhat intolerant to proteins such as those found in milk. He advised Nate to refrain from these proteins for a day or so and told me that the reason Nate didn't want to eat anything was that he understood he wouldn't be able to keep most things down. He told us to keep Nate on Pedialyte or Gatorade and wrote a prescription intended to stop Nate from vomiting. We got the prescription filled at the Walgreens there in Franklin and it seemed to really help Nate. Once that was done, we headed back over the freeway to Brentwood to pick Laura up. She said she had a great time, but was worried about Nate the entire time. Once she learned that Nate had seen Dr. Rudge, got a prescription and a positive prognosis, she was relieved. We headed back to the hotel to get ready for our evening at the dinner theater. Once we were all ready for our evening at Chaffin's Barn Dinner Theater we headed down Highway 100 for the 7:00pm start. We arrived about 10 minutes late, but that wasn't an issue. Our table had been reserved for us and had our nametags on it. We got our dinner at the buffet and enjoyed it up until 8:00pm when the show began. Nate was feeling a bit restless so we hung out in the lobby for a bit. While were were there, several members of the cast came by and visited with Nate. As it turned out, they asked his name and age and worked it into the play later that evening. There were three acts that night and we stayed through two of them. Nate was a bit tired and Laura and I decided it would be best if we all went back to the hotel and tried to get some sleep. Saturday morning was New Year's Eve day and it was our last day in town. We we had a plane to catch at 5:10pm. We decided against going to the Belle Meade plantation for lunch and instead decided to drive up Highway 65 towards Kentucky. We thought we'd go just across the border, snap a couple pictures, then head to the airport. We did that and it was actually pretty fun. On our way back into town we stopped at a grocery store to get some snacks for the ride home then headed straight to the airport. Unfortunately, we weren't so lucky with our seat assignments this time. We had two seats together and another a few rows away. The American Airlines ticket agent was kind enough to put the one isolated seat in the emergency exit row as there was more legroom there and she thought we might be able to trade it more easily once on board. She was right. Once we got on the plane, I told the guy sitting in the seat next to our two that I would trade him my spot in the emergency row and he jumped at the chance. It helped that he was pretty tall and looked cramped where he was. Now we were all sitting next to each other. Nate still wasn't feeling too well, but we had to change his diaper on the plane. We were lucky to get one change done as the majority of the flight was quite turbulent and the seat belt sign was on the whole time. There wasn't any opportunity to get up for another change. Nate was somewhat uncomfortable and therefore a bit restless. He ate lots of cookies and children's chocolate bars, and had some Pedialyte and juice, but we could tell that he was not having an enjoyable flight. Of all the flights he's been on (Orange County - Maui, Maui - Honolulu, Honolulu - Orange County, L.A. - Minneapolis, Minneapolis - L.A., L.A. - Nashville) we could tell this was his least comfortable. That said, he did the best he could and we were home before we knew it. We landed at 7:40pm on New Year's Eve then went home. Nate went straight to bed while Laura and I tried to stay up for midnight. She fell asleep. I woke her up at 12:04 and we went to sleep. We were exhausted. In the later part of November I received a call from Alicia, the lady who takes care of mom during the day, and was informed that mom had been taken to the hospital on Monday morning. She fell over the weekend when she was alone at home and was on the floor for at least a day. When Alicia arrived Monday morning she called the paramedics who took her to the hospital. I learned their practice is to take patients to the nearest facility. In this case, it was Kaiser Permanente in Canoga Park. While mom isn't a Kaiser customer, they nevertheless took her in, stabilized her, and attempted to repair her hip. According to the X-rays, mom dislocated her hip when she fell on the floor. The doctor explained to me that he might be able to pop it back into position without having to cut it open. Unfortunately, he gave it his best shot, but couldn't quite get it back where it was supposed to be. Mom spent the night there and waited all the next day for a bed to open at Cedars Sanai where she would heve her usual physicin, Dr. Isaacson, repair the hip. It took a total of two nights for a bed to open and mom was transfered in the wee hours of the morning. After she arrived, Dr. Isaacson immediately went to work. He got the hip hack into the socket. Mom rested in the hospital for a few days and was released. She went to Danny's house for a few days. While there. they noticed she had an infection. The nurse visited mom there andtold her that she needed to get back to the hospital immediately. It's Christmas day today and she is still in the hospital (Cedars Sanai, Room 7004) where she is being treated for the infection. We have no idea when she'll be released. In what we hope will become an annual tradition, Dad & Dana took the family to Disneyland for Christmas on Thursday. In addition to the two of them, those in attendance were Laura, Nate, Me, Dan, Tara, Ashlee & Carlie. We had a wonderful time and it was probably one of our best days ever. We met at Mimi's Cafe in Anaheim then went to the park. Nate had a terrific time. Dad & Dana got him some mouse ears that he really enjoyed wearing. Nate's first ride was the Pirates of the Caribbean. It scared him a little bit. On all the other rides, however, he had a terrific time and did a super job. He went on the Dumbo ride, the rockets in Tomorrowland, Winnie the Pooh in Toon Town (three times), the carousel and Small World. He also saw the Christmas Parade. It was truly a woderful night and we're already looking forward to next year. The day following Disneyland, Laura, Nate and I went to the Staples Center to see Disney's Nemo on Ice. It was OK, but not really spectacular. We sat in section 206 which was pretty good. While the show wasn't all that entertaining, it was great to spend the time with Laura and Nate doing a family activity. Tomorrow is the day when Laura's side of the family will get together for a Christmas party. They'll be coming to our house around noon. We'll have the gift exchange and spend some time visiting. Later in the day, Laura will be attending a bridal shower for a friend of hers while Nate and I will head back to the Staples Center to see the Los Angeles Kings take on the San Jose Sharks. This will be the first time Nate and I get to wear our matching jerseys to a game. We're looking very forward to that. On December 17th the Lorenze side of the family met at Dan's house in Moorpark for our annual Christmas party. We had a nice time, played the infamous gift exchange game, and pretty much relaxed around the house. On Christmas Eve we were invited to dinner at Dominic & Rose's home. They live right across the way from us so we just walked over to their place. We had a very nice time and really appreciate the invitation. On Christmas Day Laura, Nate and I went to Cedars Sanai to visit mom. Dan and Tara were there, too. We exchanged gifts and had a nice visit. We watched the Lakers vs. Miami Heat game while we were there. Afterwards, the three of us were hungry so we had a late lunch at Jerry's Deli on Beverly Blvd. in West Hollywood. It was a nice meal and one that we certainly enjoyed. Nate was well-behaved the entire time and had macaroni & cheese to eat. On Wednesday morning the three of us will head to Nashville to enjoy some time together. We'll fly non-stop from Los Angeles. This is the first time that Nate will have his own seat. On our trips to Hawaii and Minnesota, he sat in our laps. It will be interesting to see how he enjoys his own seat for the flight. We'll land around 7:30pm then check into our hotel. I selected the Marriot Residence Inn so we'll have a ktchen. This comes in handy with Nate as we need to prepare his food on the spot and need to keep his milk in a refrigerator. We have several activities planned including a visit to an ice sculpture exhibition at the Opryland Hotel. There will be horse-drawn carriage rides, slides for us to to go down and 1.5 million tons of ice see. I really don't know what to expect of this, but the reviews of the show were great so we ordered some tickets and are hoping for the best. We'll also be visiting the Country Music Hall of Fame, Having Lunch and Tea at the Belle Meade Plantation, enjoying breakfast at the Waffle House, seeing the Radio City Music Hall Rockettes perform at the Grand Ole Opry and attending a dinner theatre called Chaffin's Barn on the outskirts of Nashville where they'll be putting on a Christmas show. We have been to this place before and loved it. We hope Nate has a good time, too. Laura will also be enjoying a facial and a masage at the Decandence Day Spa in Brentwood. She be there for a little over two hours. Nate and I will try to stay out of trouble while she's there. I thought it might be fun to take Nate over to Vanderbilt University to run around and work out some of his energy. It may be too cold to do that, however. I'm sure we'll be able to come up with something fun to do. In all, this Christmas has been wonderful so far. We are very fortunate to be spending the time together and having such a great time. This has been a very busy time around the Lorenze home. Laura's dad's birthday was earlier this month so we went up to Lancaster to have lunch with him. He wanted to eat at the restaurant at Fox Field, the airport in town. It was a nice time and Nate had a good time watching the airplanes come and go. Nate is continuing with his swimming lessons every Monday morning. He can swim now and enjoys going. I don't think he liked his lessons too much in the beginning, but he stuck with it, learned how to swim, and is now enjoying his pool time each week. I really enjoy the water and hope that Nate will, too. I am really looking forward to SCUBA diving with him someday. Nate and Laura headed down to Glendale Pediatrics to see Dr. Henry and get their flu shots. So far so good, but Nate has been somewhat congested the last couple days. He's been sleeping with a humidifier the last couple nights. We've been doing some home improvement projects around the house. As part of that, I replaced the handrails that lead to our front door. Not a very complicated process, but one that has really improved things out front. Unfortunately, I shot a nail all the way through my thumb with my nail gun. It kind of took me by surpise and I was somewhat taken aback when I looked down and saw that the nail had gone all the way though. I pulled it back out then headed to the urgent care. I got a shot and was on my way. Dad's birthday was on the 18th. He was down in Mexico watching the Baja 1000. He brought Nate a nice shirt that he'll enjoy wearing. We received a DVD in the mail of Laura's graduation from Azusa Pacific University. We bought a professionally done one at the ceremony and just now got it. It was a great night and the end of a tremendous accomplishment on Laura's part. Thanksgiving was this week, too. We had originally planned to have Laura's family down, but her dad wasn't feeling that well so we took all the food up there and had an abbreviated Thanksgiving in Lancaster. Julie and Veena had come down to help with food preparation and to spend the night. They brought Nate a Batman cape that he enjoys wearing around the house. Laura and I had to get him a helment because he is prone to bumping his head on things. We also got a new coffee table for our living room. The new one is made of wicker which will be softer on him when he bumps into it. We moved the old table up to our loft. After dinner at Laura's parents' we came home and expected that we'd be going out to Danny and Tara's house to spend the night and relax after the holiday. We called them to see if they had returned from Tara's parents' house and let them know that we'd be coming out. We noticed Dan didn't sound too good on the phone and learned that he got some form of food poisoning at TGI Friday's where he had eaten chicken and shrimp. We ended up staying at home that night and went to visit on Friday morning. Dad and Dana were there and it was pretty much a relaxing day around the house. Nate had a good time. In all, Thanksgiving was fairly low key and we're enjoying the time off to relax. This has been a pretty busy week for Nate. It began with his second Halloween and his first time trick-or-treating. He dressed as one of The Wiggles, the group we saw in St. Paul. He was Murray Wiggle. Murray is the Wiggle who plays guitar. The Wiggles drive around in a big red car. So, for Halloween, Nate dressed in the same clothes that Murray wears, carried a Wiggles guitar and drove in a big red car. We think Nate had a pretty good time. We went to some houses in our neighborhood and ended up at a neighbor's house for a visit. We had a very nice time. It was a Monday evening so it probably wasn't as busy as it would have been were it a Friday or Saturday. Tonight is Saturday evening and we've had a very busy day. First off, we had our phones switched to a new carrier. The installer came over first thing this morning and got everything switched over. We also switched from our DSL internet carrier to a cable internet connection. It's lots faster and we think it will be more stable. We also added TiVo to our DirecTV service which allows us to record any program on TV and to rewind live TV. It's pretty much the same thing as a VCR but is so easy to use that it makes TV watching a completely different experience. The cable and TiVo installers just did a basic connection job which meant I spent the several hours rerouting the cables so they would be hidden from view. It took some time, but everything is fine now. The Los Angeles Kings played a rare afternoon game today against the Nashville Predators. We were there. We sat in Section 104, Row 15, Seats 9 & 10. As usual, there was quite a bit of traffic so we arrived about 15 minutes into the first period. Nate was unusually restless today and really wanted to move around. We sat through the second period and Nate had some cotton candy. In the second intermission, and during the entire third period, Nate needed to walk around so we spent the time walking the concourse and watching the game on the monitors. Nate got a big foam "Kings are #1" finger. The Kings ended up winning 3-2 after the game went to overtime and then to a shootout. Tomorrow we are going up to Lancaster to see Laura's dad. We'll go out to lunch and visit for a while then come home. This has been a really good week around the house. 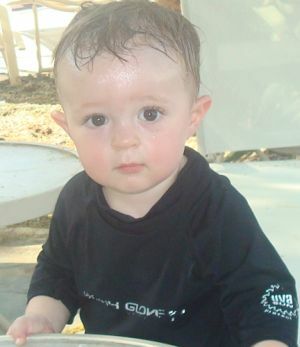 First off, Nate has been going to his swimming lessons with Laura on Mondays, Wednesdays and Fridays. This week he swam by himself. He was able to hold his breath under water and swim a short distance to Laura. Additionally, he's becoming really good at walking. On Sunday afternoon he walked all the way from the grocery store out to the car which was about 100 yards. Additionally, Nate has begun to hold his bottle all by himself. We're very proud of him. Saturday morning was Nate's grandma's birthday. The family decided to meet at a restaurant on Palmdale Blvd. called the Steer & Stein. As you can tell, it was a steak place. We had a good lunch then Laura, Nate and I were back on the freeway to Bakersfield. We headed up the 14 Freeway to the 58, through Tehachapi and into Bakersfield. We arrived way ahead of time, as planned, so we would have time to go to a place called the "Condor's Nest" where Nate and I had a couple Bakersfield Condors jerseys waiting for us. I had called a few days earlier to make sure that a couple jerseys would be there so Nate and I would have something fashionable to where to the gane that night. I was hoping that we could have got matching jerseys, but the only one they had in Nate's size (2T) was the white jersey the team wears at home. I really wanted to have one with the word "BAKERSFIELD" written across the front so I ended up with the red/tan version the team wears on the road. The white home jersey does not have "BAKERSFIELD" across the front. Once our jerseys were in hand, there were still a couple hours before game time so we went to Target to pick up some diapers, some shoes for Nate and a black turtleneck shirt Nate would wear under his new jersey. We took our time shopping as we didn't really have anywhere to go before the game. Once we were done shopping we headed over to the arena. We got there about an hour ahead of time. We changed Nate, got our jerseys on, then went inside to get a bite to eat before the game. We found our seats which were really good ones. We were in Section 102, Row A, Seats 1-3. That meant we were in the front row on the glass. The tickets went on sale exactly one week prior to the game and I bought ours online as soon as they were made available to the public. The game was good and we had fun. Bakersfield was playing the Victoria Salmon Kings. Victoria had really nice blue and gold uniforms and are a team that joined the league last year. Bakersfield won the game, but there were times when it looked as though Victoria was going to take control. There were 8,263 in attendance. In a nice gesture, all the teams in the ECHL had their goales were a Mississippi Sea Wolves jersey. The Sea Wolves are a team in the league that had their home arena wiped out in Hurricane Katrina. They will not be playing this year. As a fundraiser, the other teams in the league wore the Mississippi jersey with a Salvation Army patch on it then auctioned off the jerseys and donated the proceeds to the Salvation Army to aid in their relief efforts. So far, the jerseys are bringing in about $500 each. On Sunday we went to drop of some clothes at the Salvation Army drop-off place here in town, then headed to Kohl's to pick up some clothes and then to the grocery store to get some bananas and a treat for Nate. We came home, worked around the house, watched the LA Kings vs. Calgary Flames game and just had a nice night. It's been a very good weekend with Laura and Nate. Today is Saturday and it was a pretty relaxing one around the house. Halloween is just a couple weeks away so we thought it would be fun to take the train that runs out of Fillmore to go and get our pumpkins. This was a special train that takes people from downtown Fillmore to a pumpkin patch about 3-4 miles away. We woke up around 7:30 and got ready to go. We headed out to Fillmore and bought out tickets. We were joined by friends of our, The Copelands. We boarded the train and selected a train car that was open to the outside so we could enjoy the sun and get a good view of everything around us. The ride took about 20-30 minutes or so and dropped us off right at the pumpkin patch. Once we got there we looked for some pumpkins then had lunch. We visited for a bit then boarded the train for our return trip to Fillmore. We decided to sit inside this time as the sun was out in full force. In all, it was a fun trip. Nate did a great job on the train and was super at the pumpkin patch. Dan sent me some pictures of his recent race from Vegas to Reno. You can see them by clicking on the PHOTO ALBUM icon. The results from the race can be viewed HERE. Pops and Dana called us from Chicago this evening. They went back there to see the USC vs. Notre Dame game. USC is ranked #1 in the nation and Notre Dame is #9. The game was extremely exciting with USC winning in the final seconds. Although I'm not completely sure as to Dad and Dana's itinerary, I believe they will see the USC game today, watch the NFL Bears game tomorrow, then head out on the train to Glacier National Park for one evening. This means they'll leave Chicago, head to Minneapolis, up to Fargo, across North Dakota, through Montana and Idaho then into Washington where they'll see a Washington State football game. It sounds like a really fun trip. One of the biggest pieces of news we've had lately is that Nate has begun to walk! He is doing a wonderful job. He seems to have great balance and is even picking things up off the ground while he is standing on his feet. He walks all over the place and appears to be quite confident. It's clear he realizes he's learned something new. We're both very proud of him. On Sunday Laura, Nate and I attended something called "Kidfest 2005" which was an event that promoted all things kid-related in the Santa Clarita Valley. We were vendors there to advertise our tutoring business. Nate slept through most of the event. It lasted from about 8:30am-4pm for us. Nate did quite a bit of walking during the day, however. The event was held at Golden Valley High School in Canyon Contry. Nate walked for about 200 yards on his own around the gymnasium. He continues to impress us on a daily basis. This weekend has been a pretty relaxing one. Nate and I are both sick, but we're getting better. Nate had a temperature that was somewhat lower than it should have been. We called his pediatrician who talked to us for a bit. It was determined that Nate needed to be kept warm and we'd repeatedly check him to see if he was improving. He did. His temperature got pretty close to normal and we think he's fine now. People we know gave us some tickets to the LA Kings vs. Minnesota Wild game at the Staples Center tonight. The Kings won 2-1 in overtime and the three of us had a really good time. We arrived a bit late due to some heavy traffic and an accident on the freeway. We got there around the middle of the first period. Our seats were in Section 104, Row 15, Seats 11 & 12. They were the best we've had so far at the Staples Center. Nate did a really good job the whole night. He was well behaved and those around us enjoyed him. He wore his Kings warm-up pants, his personalized Kings jersey with a black turtleneck underneath, and a Kings hat. For dinner, Laura had a hot dog and I had some sushi. Nate ate the avacado out of the sushi the had some Cheerios and milk. We got a few things at the Kings' merchandise stand, too. Nate got a mini hockey stick, a beanie/mittens set and an old-style Kings jersey. The drive home was pretty smooth. Nate watched a Booh Bah DVD all the way. When we arrived home Nate took a bath and went to bed. In all, it was a great way to spend the day. It's still hard for me to believe that I lived a dream of mine by taking my son to an NHL game. There is alot to say about just having a regular day around the house. Today is Monday and we didn't have anything special planned. It was a work day and a day that Laura and I worked in our office. The entire day I kept thinking about how I couldn't wait to get home and see Nate. One of the greatest things about being Nate's dad is that it makes every day a fun one. After I got home tonight I took some pictures of Nate in our bedroom. He was walking and crawling all over the place. I think the photos look good in that is surrounded by mirrors which adds a nice effect to them. In the pictures he's wearing pajamas we got yesterday at the Disney Store. We got two of them. They are size 18mos and they look like they're only going to last him a month or so. He's just 12mos. We ordered a Los Angeles Kings sweatsuit for Nate online yesterday. I got an email from the company that said they have already shippedit via UPS so it should be here in no time. On this website there is a picture of Pops in Mississippi on Nate's birthday. He's standing in front of a sign he made wishing Nate a happy birthday. I sent that photo to Wal-Mart via email and had it made into a poster. We'll hang that poster in Nate's room when it arrives. This Thursday dad and Dan, along with Derrick Diegel and Derrick Lantz, will head to Las Vegas to compete in the Best in the Desert race that runs from Vegas to Reno. The race will be on Friday morning and should last all day. Dan has done this a few times before by himself. This will be the first time he has done it with team members. I believe they'll be riding Dan's 2005 Yamaha WR450. Dad will be the pit crew. Once the race is over, the guys will head down Highway 395 to Dad & Dana's condo in Mammoth. The rest of the week should be somewhat calm around the house. We don't have anything special planed at this point. Hockey season is just around the corner and I am waiting for the Bakersfield Condors to put their opening day tickets on sale. I'd like to get as close the the ice as possible for that game. I believe the Condors will play the Victoria Salmon Kings that night. Nate is increasingly mobile around the house. He opens up all the cabinets, plays with the cat food and water, and enjoys tossing things into the toilets. He's become quite proficient at climbing our stairs. He can make it all the way to the top without any problem. We're very proud of him. It's an important day here in the life of the website. I have split the page to allow for easier reading on your part and to symbolize the conclusion of Nate's first year of life. Click the link below to see the website in its entirety. To read prior journal entries click HERE.